CaV1.3 channels regulate excitability in many neurons. As is the case for all voltage-gated channels, it is widely assumed that individual CaV1.3 channels behave independently with respect to voltage-activation, open probability, and facilitation. Here, we report the results of super-resolution imaging, optogenetic, and electrophysiological measurements that refute this long-held view. We found that the short channel isoform (CaV1.3S), but not the long (CaV1.3L), associates in functional clusters of two or more channels that open cooperatively, facilitating Ca2+ influx. 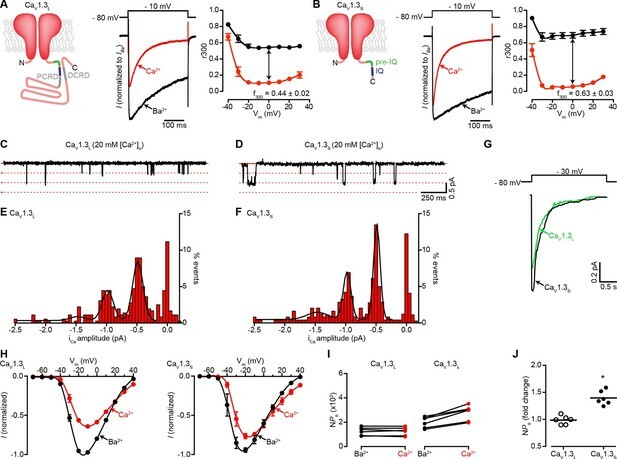 CaV1.3S channels are coupled via a C-terminus-to-C-terminus interaction that requires binding of the incoming Ca2+ to calmodulin (CaM) and subsequent binding of CaM to the pre-IQ domain of the channels. Physically-coupled channels facilitate Ca2+ currents as a consequence of their higher open probabilities, leading to increased firing rates in rat hippocampal neurons. We propose that cooperative gating of CaV1.3S channels represents a mechanism for the regulation of Ca2+ signaling and electrical activity. The electrical charge inside a cell is different from that outside of the cell. Neurons rely on this difference to send signals via electrical impulses. This process involves ions moving across the neuron’s membrane through proteins called ion channels. Cav1.3 channels are ion channels that open when the membrane’s electrical charge changes to allow positively charged calcium ions into the cell. This generates an electrical current that enables neurons in the brain to produce repetitive impulses. Calcium ions entering through a Cav1.3 channel can encourage the channel to allow in even more calcium ions. A closely related channel called Cav1.2, which is essential to the activity of heart muscle, behaves in a similar way. Researchers have recently found that Cav1.2 channels are arranged in clusters in the membrane and that adjacent channels interact to allow more calcium ions through the channels. This was an unexpected finding because it had long been thought that all ion channels acted independently. Moreno et al. have now used a range of different approaches to investigate the behavior of one form of the Cav1.3 channel, called CaV1.3S, in human cells and in neurons from rat brains. Initial experiments confirmed that calcium ions stimulated these channels to open in a coordinated way and to allow in more calcium. High-resolution microscopy then revealed that the CaV1.3S channels do form clusters in the cell membrane. Moreno et al. went on to demonstrate that this simultaneous opening of CaV1.3S channels first requires a protein called calmodulin to bind calcium inside the cell. Next, the calcium-calmodulin complex associates with the parts of the channels that are also inside the cell. Further experiments showed that coupling the Cav1.3 channels together allows them to cooperate, and makes them more likely to be open and generate bigger calcium flows, and allowed neurons to send electrical signals more frequently. Future challenges include investigating how the clusters of Cav1.3 channels are established and maintained, and determining how the channels’ cooperation plays a role in both healthy and diseased states. CaV1.3 channels are widely expressed in neurons throughout the brain and spinal cord (Tan et al., 2011), where they serve a number of critical functions including the modulation of resting potentials, the amplification of synaptic currents and the generation and shaping of repetitive firing (Guzman et al., 2009; Olson et al., 2005; Striessnig et al., 2006). These channels are dihydropyridine-sensitive L-type Ca2+ channels composed of a pore-forming CaV1.3α1 subunit and accessory β and α2-δ subunits. The carboxy-terminus (C-terminus) of the α1D subunit is structurally complex, containing an EF hand domain as well as pre-IQ and IQ domains to which the Ca2+-binding protein calmodulin (CaM) binds (Ben-Johny and Yue, 2014). Alternative splicing results in the expression of 'long' and 'short' CaV1.3 channel isoforms that differ in the length of the C-terminus (Singh et al., 2008). The splice variant 42A (CaV1.3S) has a short C-terminus of 183 amino acids long compared to the 695 amino acids of the long isoform (CaV1.3L). The CaV1.3S channels lack the so-called C-terminal modulatory domain (CTM), comprised of proximal (PCRD) and distal (DCRD) regulatory domains that block CaM binding to the IQ domain (Figures 1A and B, left). As a consequence, CaV1.3S channels activate at lower voltages, have a higher open probability, and inactivate faster than CaV1.3L channels (Bock et al., 2011; Singh et al., 2008; Tan et al., 2011). Ca2+ enhances the activity of CaV1.3S, but not CaV1.3L, channels. (A) Left: Schematic of CaV1.3L channel splice variant, depicting the domains important for Ca2+-mediated regulation: pre-IQ (green), IQ (blue), proximal and distal C-terminal regulatory domains (PCRD, DCRD, gray). Middle: Representative ICa and IBa of CaV1.3L channels expressed in tsA-201 cells. Currents were evoked by a 300-ms depolarization from holding potential of -80 mV to a test potential of -10 mV, with 2 mM Ba2+ (black) or 2 mM Ca2+ (red) as the charge carrier in the same cell. Right: Voltage dependence of CaV1.3L channel CDI. r300 is the fraction of ICa or IBa remaining after 300 ms. f300 is the difference between ICa and IBa r300 values at 0 mV. (B) Left: Schematic of CaV1.3S channel splice variant. Middle: Representative ICa and IBa of CaV1.3S channels. Right: Voltage dependence of CaV1.3S channel CDI, format as in (A). ICa is presented as normalized to IBa, currents analyzed for these experiments were in a range between 200 and 900 pA. (C and D) Representative iCa single channel recordings from CaV1.3L (C) and CaV1.3S channels (D) expressed in tsA-201 cells during step depolarizations from -80 to -30 mV. (E and F) all-points iCa amplitude histograms for CaV1.3L (E) and CaV1.3S channels (F), the black line is the best fit to the data with a multi-Gaussian function with a quantal unit value of -0.48 ± 0.07 for CaV1.3L and -0.49 ± 0.01 pA for CaV1.3S channels, respectively (constructed from n = 6 cells each). Single channel recordings were also performed using Ba2+ as the charge carrier for both channels (see Figure 1—figure supplement 1). (G) Ensemble average single-channel currents from multiple sweeps. (H) Current-voltage relationships of CaV1.3L currents (left) and CaV1.3S currents (right) in the presence of 2 mM Ca2+ (red) or Ba2+ (black) as the charge carrier. Data were normalized to the maximum current in the presence of Ba2+. Symbols are averages of 7 cells ± SEM. (I) Scatter plots of NPo (at -10 mV) of CaV1.3L (left) and CaV1.3S (right) channels in the presence of Ba2+ and Ca2+. (J) Change in NPo for CaV1.3L and CaV1.3S channels for currents recorded in the presence of Ca2+ and then Ba2+. The horizontal bar shows the mean value (*p < 0.001). CaV1.3 channels carry about 20% of the L-type calcium current in hippocampal neurons (Moosmang et al., 2005). As CaV1.3S channels activate at low voltages, they are a particular good candidate for underlying the sustained the neuronal firing and the persistent low- voltage-activated current observed in CA3 neurons (Avery and Johnston, 1996). In fact, CaV1.3 channels support spontaneous firing of dopaminergic neurons in the substantia nigra and mid-spiny striatal neurons (Guzman et al., 2009; Olson et al., 2005). The function of CaV1.3 channels is tightly regulated by changes in intracellular Ca2+ ([Ca2+]i). The opening of CaV1.3 channels causes a local increase in [Ca2+]i that induces two opposing regulatory mechanisms: Ca2+-dependent inactivation (CDI) and Ca2+-dependent facilitation (CDF) (Ben-Johny and Yue, 2014). CDF manifests as an increase in the magnitude of the CaV1.3 current (ICa) with repetitive activation. In neurons, CDF can induce a persistent ICa that increases firing rate and may even lead to self-sustained firing (Fransen et al., 2006; Major and Tank, 2004; Sheffield et al., 2013). It has been proposed that CDF of the CaV1.3 channel depends on Ca2+/CaM-dependent kinase II (CaMKII)-mediated phosphorylation, as has also been proposed for the closely related CaV1.2 channel (Hudmon et al., 2005; Xiao et al., 1994; Yuan and Bers, 1994). This phosphorylation requires the presence of a second protein, densin, which binds to the PDZ domain located in the most distal part of the C-terminus of the channel (Jenkins et al., 2010). Because CaV1.3S lacks that PDZ domain, CaMKII-mediated phosphorylation is unlikely to be responsible for CDF in CaV1.3S channels. Thus, the mechanisms underlying the CDF of the widely expressed CaV1.3S channel have not yet been resolved. Two recent studies by Dixon et al. 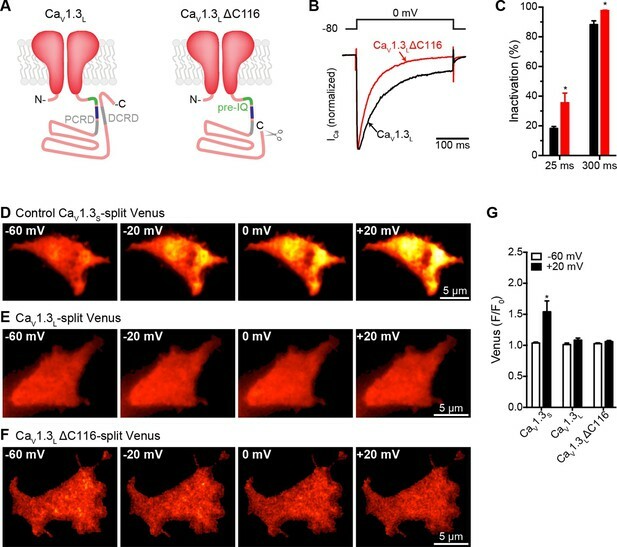 (Dixon et al., 2012; 2015) have suggested the tantalizing hypothesis that Ca2+-induced interactions between the C-termini of neighboring CaV1.2 channels facilitates Ca2+ influx by increasing the activity of adjoined channels in cardiac muscle. At present, however, whether this physical and functional coupling of CaV1.2 channels is a common mechanism for the control of Ca2+ influx via voltage-gated Ca2+ channel function, including CaV1.3 channels is unknown. Furthermore, the possibility that cooperative CaV1.3 channel gating regulates neuronal excitability is also unclear. In the present study, using electrophysiological, optogenetic, and super-resolution imaging approaches, we discovered that CaV1.3S channels form functional clusters of two or more channels along the surface membrane of hippocampal neurons. 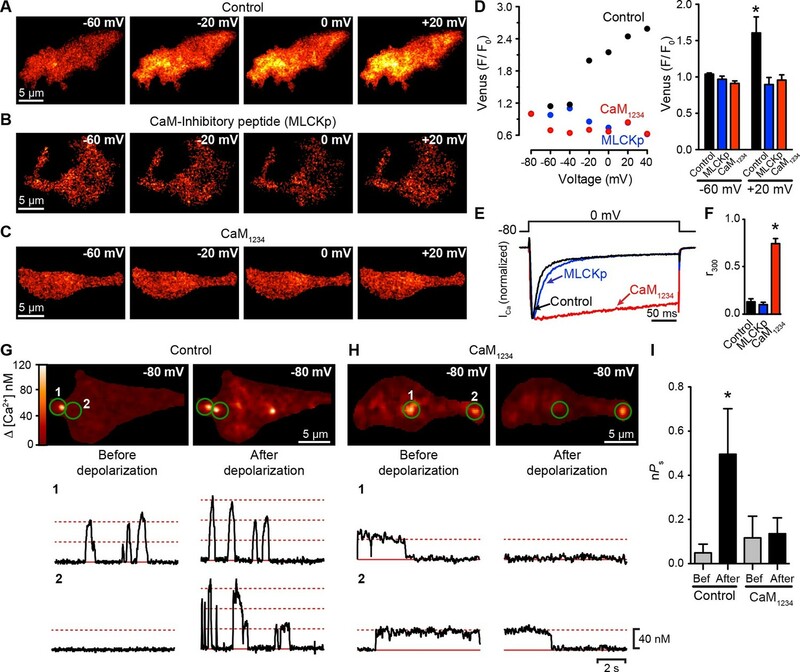 Clustered CaV1.3S channels undergo Ca2+-induced physical interactions that increase the activity of adjoined channels, facilitate Ca2+ currents and thereby increase firing rates in hippocampal neurons. We propose that cooperative gating of CaV1.3S channels is a new general mechanism for the amplification of Ca2+ signals in excitable cells. Because CaV1.3 channels are alternatively spliced, we first sought to determine whether CaV1.3S and CaV1.3L channels are differentially regulated by [Ca2+]i. Macroscopic currents were recorded from tsA-201 cells expressing either CaV1.3S or CaV1.3L channels in the presence of 2 mM Ba2+ or 2 mM Ca2+. Currents were activated by a depolarizing pulse (300 ms) from a holding potential of -80 mV to -10 mV. With Ba2+ in the external solution, membrane depolarization induced large CaV1.3L currents that inactivated slowly (Figure 1A, center). Switching to a perfusion solution containing Ca2+ decreased the amplitude of CaV1.3L currents by nearly 40% and increased the rate of inactivation. Like CaV1.3L currents, CaV1.3S currents inactivated faster when Ca2+ was used as a charge carrier however, in agreement with previous reports (Bock et al., 2011; Singh et al., 2008), we observed more pronounced CDI (defined as the difference between inactivation of IBa and ICa) in CaV1.3S channels compared to the CaV1.3L variant (Figure 1B, right versus Figure 1A, right). As discussed above, this difference in the magnitude of CDI has been attributed to the lack of the CTM domain in CaV1.3S channels. Curiously, the amplitude of CaV1.3S currents decreased to a lesser extent (only about 15% at -10 mV) upon changing the external solution from Ba2+ to Ca2+ (Figure 1B, center). We investigated whether differences in the amplitude of elementary CaV1.3L and CaV1.3S channel currents could, at least in part, account for these disparities in macroscopic Ca2+ and Ba2+ currents. Single CaV1.3L and CaV1.3S channel currents were recorded from cell-attached patches with pipettes containing 20 mM Ca2+ or Ba2+. With Ca2+ as the charge carrier, the amplitudes of elementary CaV1.3S and CaV1.3L channel currents were similar. For example, at -30 mV they were -0.48 ± 0.07 and -0.49 ± 0.01 pA for CaV1.3L and CaV1.3S channels, respectively (Figures 1C–F). These values are in accordance with the unitary currents reported by Guia et al. for cardiac L-type channels using Ca2+ as charge carrier (Guia et al., 2001). Ensemble averages revealed currents that activated quickly and then inactivated likely due to Ca2+ and voltage-dependent mechanisms (Figure 1G). Furthermore, as is the case for other CaV1 channels, the single channel currents produced during the opening of CaV1.3L and CaV1.3S channels were both larger with Ba2+ as the charge carrier than with Ca2+ (-1.14 ± 0.02 pA and -1.10 ± 0.02 pA for CaV1.3L and CaV1.3S at -30 mV, respectively), but not significantly different from each other (Figure 1—figure supplement 1). The amplitude of the unitary currents with Ba2+ is also in accordance with previously reported values for these channels (Bock et al., 2011). These data suggest that the difference observed in the macroscopic currents between the CaV1.3L and CaV1.3S channels is not due to differences in unitary currents. We then tested the hypothesis that Ca2+ enhances the activation of CaV1.3S, but not CaV1.3L channels by increasing the channel activity (NPo). We performed a quantitative analysis of NPo. The whole-cell current (I) is given by the equation I = i*N*Po, where i is the amplitude of the elementary current, N is the number of functional channels, and Po is the channel open probability. Since elementary CaV1.3L and CaV1.3S currents are larger when Ba2+ rather than Ca2+ is the charge carrier, for ICa to be similar to IBa, the NPo of CaV1.3S must be higher in the presence of Ca2+ than Ba2+. We estimated NPo with Ca2+ and Ba2+ as charge carriers by dividing the amplitude of whole-cell CaV1.3S and CaV1.3L currents at -10 mV, by the values of unitary current. Our analysis relies on the assumption that the relatively larger peak of CaV1.3S currents in the presence of Ca2+ was not due to faster activation kinetic of this channel than that of CaV1.3L channels. This assumption is reasonable, as we found no significant difference in the activation time constants for CaV1.3L and CaV1.3S currents that were 1.60 ± 0.22 and 1.17 ± 0.051 ms (-10 mV, n = 6 for each channel, p = 0.112), respectively. We used elementary currents values recorded with 2 mM Ca2+ (-0.16 pA) and Ba2+ (-0.24 pA) at -10 mV (Guia et al., 2001). We found that Ca2+ ions entering the cell through the channels increased the NPo nearly 1.5-fold for CaV1.3S channels, but not at all for CaV1.3L channels (Figures 1I and J). Thus, assuming that the number of functional CaV1.3 channels (N) in the membrane remained constant, a reasonable assumption given the short time lapse (~2 min) between recording IBa and ICa from the same cell, these data suggest that a Ca2+-dependent mechanism enhances inward Ca2+ currents by increasing the Po of CaV1.3S channels, but not that of CaV1.3L channels. One possible explanation for the Ca2+-influx–dependent increase in the Po of CaV1.3S channels is cooperative gating among channels in small clusters, as we have previously reported for CaV1.2 channels in cardiomyocytes and smooth muscle cells (Navedo et al., 2010). To test this possibility, we made optical recordings of individual CaV1.3S-mediated Ca2+ influx events (called 'sparklets') in CaV1.3L and CaV1.3S-expressing tsA-201 cells loaded with 200 µM Rhod-2 using total internal reflection fluorescence (TIRF) microscopy. CaV1.3S sparklets were recorded at a membrane potential of -80 mV in the presence of 20 mM external Ca2+; 10 mM EGTA was included in the patch pipette to confine the [Ca2+]i signal to within ~1 µm of the point of Ca2+ entry (Zenisek et al., 2003). A quantal analysis of CaV1.3S and CaV1.3L sparklets revealed the presence of single-level (elementary) events with a mean amplitude of ~40 nM for both channels, in agreement with our previous study (Navedo et al., 2007). Interestingly, consistent with our single channel data, we found that multi-quantal sparklets, which presumably result from the simultaneous opening of several CaV1.3 channels, were more commonly observed in cells expressing CaV1.3S than CaV1.3L channels (Figure 2A). To determine whether channels in a cluster opened cooperatively or independently, we calculated the coupling coefficient (κ) among channels within a CaV1.3S and CaV1.3L sparklet site by applying a coupled Markov-chain model (Chung and Kennedy, 1996). Channels with κ > 0.1 were considered coupled (Navedo et al., 2010). Using this approach, we found that the average κ value for CaV1.3S and CaV1.3L channels was 0.21 ± 0.05 (n = 15) and 0.08 ± 0.04 (n = 12), respectively (Figure 2B). These results support the hypothesis that CaV1.3S channels are more likely to undergo cooperative gating, generating persistent and greater Ca2+ influx than CaV1.3L channels. CaV1.3S but not CaV1.3L channels gate cooperatively to increase Ca2+ influx. (A) TIRF images of spontaneous CaV1.3S (top) and CaV1.3L sparklets (bottom) at a holding potential of -80 mV in tsA-201 cells expressing the respective channels. Traces at the right show the time course of [Ca2+]i in the sites marked by the green circles. The dotted red lines show the amplitudes of 1 to 3 quantal levels. The coupling coefficient (κ) is shown above each trace. (B) Bar chart showing the coupling coefficient for the CaV1.3S and CaV1.3L sparklets sites. Bars are averages of 5 cells ± SEM (*p<0.05). If the signal for cooperative CaV1.3S channel gating is a local increase in [Ca2+]i, these channels must be in close proximity to one another. To test this hypothesis, we examined the spatial organization of endogenous CaV1.3 channels in hippocampal neurons using super-resolution localization microscopy (Figure 3A–D). Hippocampal neurons were immunostained against CaV1.3 using an antibody kindly provided by Dr. William Catterall and Dr. Ruth Westenbroek. This analysis showed that CaV1.3 channels form clusters occupying an average area of 3660 ± 80 nm2 (n = 5). The antibody used in this study has been shown to not recognize the corresponding sequence of the closely related CaV1.2 α subunit in both, transfected cells and hippocampal tissue (Hell et al., 1993; 2013). However, we were not able to test the specificity of the antibody on CaV1.3-KO neurons and thus, pursued our analyses of channel clustering using a heterologous expression of CaV1.3 channels in tsA-201 cells. CaV1.3 channels assemble into clusters in the plasma membrane of cultured hippocampal neurons. (A) Wide-field image of a representative cultured hippocampal neuron immunostained for CaV1.3 channels (red) and the neuronal marker microtubule-associated protein 2 (MAP2; green). (B) Super-resolution (GSD) image of CaV1.3 channels in the outlined region in (A). (C) Comparison of conventional (TIRF, left) and super-resolution (GSD, right) images of CaV1.3 clusters in zones i and ii outlined in (B). (D) Frequency distribution of the area of CaV1.3 channel clusters (n = 5320 clusters from 5 cells). (E) TIRF image of CaV1.3S-mGFP channels expressed in cultured hippocampal neurons (left). Examples of sequential photobleaching steps for three different clusters (right). (F) Frequency distribution of CaV1.3S cluster bleaching steps (n = 1105 clusters from 18 cells). Clustering of CaV1.3S and CaV1.3L channels was tested in tsA-201 cells expressing the respective isoform (See also Figure 3—figure supplement 1). The specificity of the antibody in tsA-201 cells was tested by immunostaining untransfected and CaV1.3S-transfected cells. No evidence of staining was observed in the untransfected cells (Figure 3—figure supplement 1A, n = 4). As our antibody cannot distinguish between CaV1.3 channels isoforms, we expressed CaV1.3L or CaV1.3S channels separately and found that both channel subtypes form clusters of similar size (Figure 3—figure supplement 1B–F). The mean areas of CaV1.3L and CaV1.3S channel clusters were 2543 ± 50 nm2 and 2119 ± 73 nm2, respectively (Figure 3—figure supplement 1G, n = 7). GSD images were acquired in the TIRF focal plane with a penetration depth of 130 nm. To determine the number of channels within CaV1.3 channel clusters, we used step-photobleaching (Ulbrich and Isacoff, 2007), of expressed green fluorescent protein (GFP)-fused CaV1.3S channels in hippocampal neurons (Figure 3E and F) and tsA-201 cells (Figure 3—figure supplement 1G and H). The rationale for using only CaV1.3S-GFP channels in these studies is twofold. First, CaV1.3S and not CaV1.3L channels have the ability to undergo coupled activation. Second, the size of CaV1.3L and CaV1.3S puncta (at least in tsA-201 cells) is similar. Thus, CaV1.3L and CaV1.3S clusters are likely composed of the same number of channels. We identified and excited single CaV1.3S channel clusters in hippocampal neurons and tsA-201 cells using TIRF microscopy with a penetration depth of 130 nm. Although some intracellular signal could be collected, the use of TIRF restricts the signal mainly to the plasmalemmal fraction of the channels. After continuous photobleaching we counted the number of step-wise decreases in fluorescence intensity of CaV1.3S-GFP clusters. The majority (65%) of CaV1.3S clusters underwent at least five stepwise decreases in fluorescence, with the remaining clusters showing fewer steps. A single photobleaching step was observed in only 4% of the CaV1.3S clusters. The mean number of CaV1.3S channels per cluster determined through sequential photobleaching was 8 ± 1 (n = 1105 clusters, 18 cells) in hippocampal neurons, this number is consistent with the average cluster area calculated from our super-resolution data and is similar to that reported in two different studies on the L-type channel distribution in hippocampal neurons using immunogold-labeling with electron microscopy and high-resolution immunofluorescence techniques (Leitch et al., 2009; Obermair et al., 2004). Step-photobleaching in tsA-201 cells revealed an average of 5 ± 1 CaV1.3S channels per cluster (n = 585 clusters, 11 cells), consistent also with our super-resolution cluster area measurements (Figure 3—figure supplement 2). Collectively, these results support our working hypothesis that multi-quantal events detected by imaging Ca2+ influx represent the simultaneous activity of multiple CaV1.3S channels in a membrane microdomain. Furthermore, our data suggest that although channel clustering may be necessary for functional coupling of adjacent CaV1.3S channels, physical clustering alone is not sufficient to induce functional coupling in CaV1.3L channels. 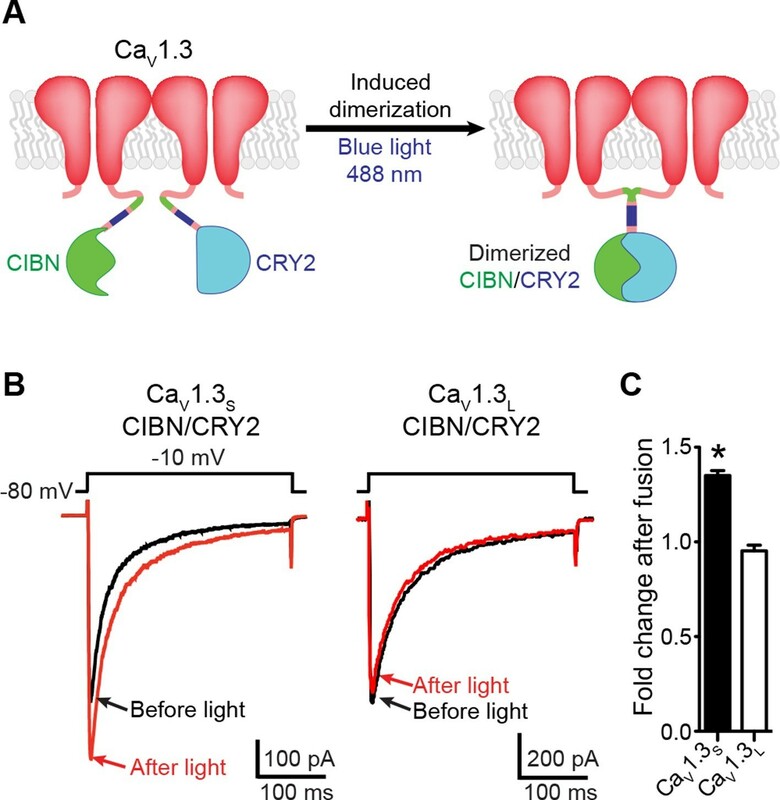 To determine whether a physical interaction between CaV1.3S channels induces ICafacilitation, we fused the C-terminus of CaV1.3S and CaV1.3L channels to an optogenetic light-induced dimerization system based on CIBN and CRY2 proteins (Kennedy et al., 2010). Blue-light illumination (488 nm), promotes CIBN and CRY2 fusion, which forces the C-termini of the attached channels to interact (Figure 4A). Light-induced fusion increases ICa amplitude in CaV1.3S but not in CaV1.3L channels. (A) Schematic of the blue light-induced dimerization system (CIBN-CRY2) fused to the C-terminal of CaV1.3S channels. The same proteins were fused to the C-terminal of CaV1.3L channels (not shown in schematic). (B) Representative current records from tsA-201 cells expressing CaV1.3S-CIBN/CaV1.3S-CRY2 (left) or CaV1.3L-CIBN/CaV1.3L-CRY2 (right), before (black traces) and after (red traces) induction of channel coupling by excitation with a 30 s pulse of 488 nm light. (C) Bar plot of the averaged fold-change in ICa following 488 nm excitation in cells expressing CaV1.3S-CIBN/CaV1.3S-CRY2 (black) or CaV1.3L-CIBN/CaV1.3L-CRY2. Bars are averages of 5 cells ± SEM (*p<0.05). We transfected tsA-201 cells with CaV1.3S-CIBN and CaV1.3S-CRY2 or CaV1.3L-CIBN and CaV1.3L-CRY2 channels and measured ICa in response to a series of depolarizing voltage steps before and after a 30-s exposure to blue light (488 nm) (Figure 4B). As shown in Figure 4C, in cells expressing CaV1.3S-CIBN and CaV1.3S-CRY2 channels, ICa amplitude increased by 35% (n = 6, p<0.001) after illumination, whereas in cells expressing CaV1.3L-CIBN and CaV1.3L-CRY2 channels, there was no change in current amplitude (0.95 ± 0.03 n = 6). These results suggest that fusing adjacent channels at the tip of their C-tail increase the probability of functional coupling between CaV1.3S adjoined channels but not between CaV1.3L channels. We used a second optogenetic approach that entailed fusing CaV1.3S and CaV1.3L channels with either the N- (VN) or C-terminus (VC) of the Venus fluorescent protein (Kodama and Hu, 2010; Shyu et al., 2006) (Figure 5A). Individual VN and VC fragments are non-fluorescent, but when they come into close proximity, they can reconstitute a full Venus protein, resulting in fluorescence. Venus reconstitution is irreversible and thus, the intensity of the fluorescence signal increases with time, proportionate to the number of CaV1.3S/L-VN and CaV1.3S/L-VC channels that physically associate. Coupling of CaV1.3S channels is Ca2+-dependent and increases channel activity. (A) Schematic of CaV1.3S fused to VN and VC fragments of the Split Venus bimolecular fluorescence complementation system. (B) TIRF images of Venus fluorescence reconstitution in the presence of 20 mM Ca2+ in tsA-201 cells expressing CaV1.3S-VN and CaV1.3S-VC (top). Fluorescence reconstitution was measured in response to 9-s depolarizing voltage steps from a holding potential of -80 mV to test potentials of -60 mV to +60 mV. ICa currents evoked at the different voltage steps (bottom). (C) Voltage-dependence of the normalized conductance (G/Gmax) of the ICashown in (B). Dashed curve is the fit to a Boltzmann function. (D) Voltage-dependence of Venus fluorescence reconstitution in the presence of 20 mM Ca2+. The Boltzmann function calculated in (C) is superimposed to compare voltage-dependence. (E) Bar plot of averaged Venus fluorescence in the presence of 20 mM Ca2+ at -60 mV and +20 mV. Bars are averages ± SEM (*p<0.05, n = 5 cells). (F) TIRF images of Venus fluorescence reconstitution in the presence of 2 mM Ba2+ in tsA-201 cells expressing CaV1.3S-VN and CaV1.3S-VC (top). Format and protocol are as in (B) IBa currents evoked at the different voltage steps (bottom). (G) Voltage dependence of normalized conductance (G/Gmax) of the IBashown in (F). Dashed curve is the fit to a Boltzmann function. (H) Voltage dependence of Venus fluorescence reconstitution in the presence of 2 mM Ba2+. The Boltzmann function calculated in (G) was superimposed to compare voltage-dependence. (I) Bar plot of averaged Venus fluorescence in the presence of 20 mM Ca2+ at -60 mV and +20 mV. Bars are averages of 5 cells ± SEM (*p<0.05). Venus reconstitution was also tested in the presence 2 mM Ca2+ (See Figure 5—figure supplement 1) (J) Top: TIRF images of CaV1.3S sparklets recorded at -80 mV in 20 mM Ca2+, before depolarization (left), after the same depolarization protocol used in (B, F) in the presence of 2 mM Ba2+ (center), and after depolarization in the presence of 20 mM Ca2+ (right). Green circles indicate sparklet sites. Bottom: Traces of the time course of [Ca2+]i in sites 1 and 2 under the three conditions. (K) Bar plot of the averaged CaV1.3S sparklet activity (nPs) before depolarization (black; average is ~0), after depolarization in Ba2+ (gray), and after depolarization in Ca2+ (red). Bars are averages ± SEM (*p<0.05, n = 5 cells). (L) Bar plot of sparklet density. Format as in (K). (M) Event amplitude histograms of CaV1.3S sparklets recorded after depolarization in the presence of Ba2+ (gray) or Ca2+ (red). The amplitude of elementary CaV1.3 sparklets was calculated by fitting histograms to a multicomponent Gaussian function. The experiments in this figure were performed using the CaV1.3S channel encoded by the Addgene plasmid 26576, similar results for split Venus reconstitution and sparklet activity were observed for the plasmid 49,333 (Figure 5—figure supplement 2). We simultaneously recorded ICa and obtained TIRF microscopic images from tsA-201 cells transfected with CaV1.3S -VN and CaV1.3S -VC. The first set of experiments was performed in the presence of 20 mM Ca2+ to mimic the experimental conditions used to record Ca2+ sparklets below. With 20 mM Ca2+ in the bathing solution, ICa and Venus fluorescence for CaV1.3S channels increased in parallel in response to depolarizing pulses from a holding potential of -80 mV (Figure 5B). The normalized conductance and Venus fluorescence exhibited similar sigmoidal voltage dependencies (Figures 5C–D), which can be attributed to the irreversible nature of the Venus reconstitution, resulting in an increased number of fluorescent proteins with each successive depolarization as the open probability of CaV1.3S channels increases. Substituting 2 mM Ba2+ for 20 mM Ca2+ in the external solution led to a robust IBa during membrane depolarization, but caused no accompanying change in Venus fluorescence (Figures 5F–I). Importantly, Venus reconstitution was never observed in cells expressing CaV1.3L-VN and CaV1.3L-VC in (see Figure 8). 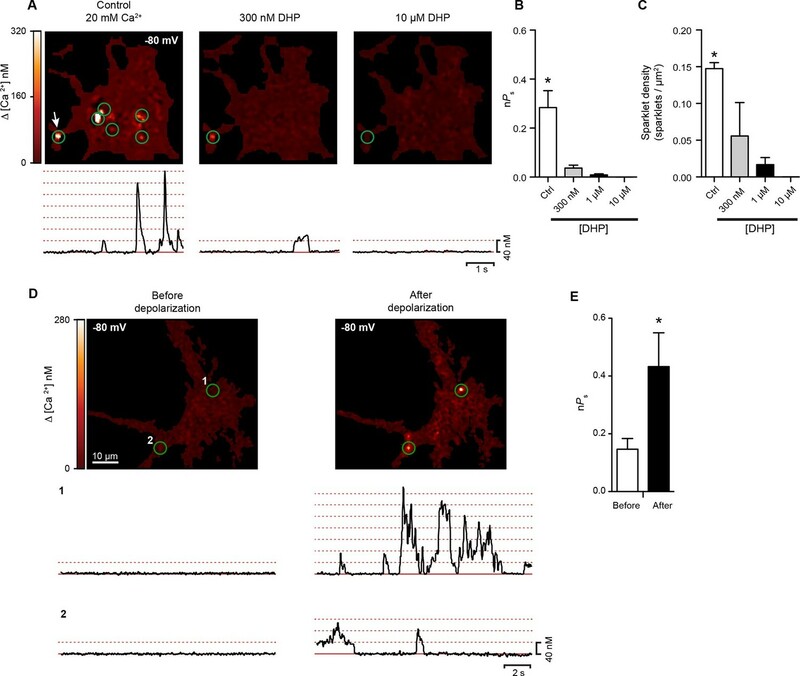 These data indicate that CaV1.3S channels, but not CaV1.3L channels, can physically interact via their C-termini, that this association occurs in response to membrane depolarization, and that it is promoted by intracellular Ca2+. Because Venus reconstitution is irreversible, once CaV1.3S-VN and CaV1.3S-VC channels fuse they must remain adjoined. Thus, we tested the hypothesis that Ca2+-induced fusion of CaV1.3S-VN and CaV1.3S-VC increases the activity of adjoined channels by recording CaV1.3S sparklets at a holding potential of -80 mV, in the presence of Ba2+ or Ca2+, before and after applying the same depolarization protocol described above. Before depolarization, CaV1.3S sparklet activity was very low (Figure 5J); after depolarization, CaV1.3S sparklet activity (nPs; Figure 5K) and sparklet density (Figure 5L) markedly increased in the presence of Ca2+, but not Ba2+, without a change in the amplitude of the elementary Ca2+ influx (Figure 5M). To investigate the mechanism underlying the Ca2+-dependency of CaV1.3S channel coupling further, we used the Venus system in conjunction with a mutagenesis approach, focusing on CaM, which is required for CDF and has been shown to bind Ca2+ and associate with the C-terminus of L-type Ca2+ channels (Zuhlke et al., 1999). tsA-201 cells were transfected with CaV1.3S-VN/CaV1.3S-VC and divided into three groups. Cells in the first group (controls) were dialyzed with a standard Cs+-based intracellular solution. Cells in the second group were dialyzed with a CaM-inhibitory peptide corresponding to a 15-aa fragment of the wild-type CaM-binding domain of myosin light chain kinase (MLCKp; 1 μM), which binds to CaM with high affinity (apparent dissociation constant, ~6 pM) in the presence of Ca2+ (Torok and Trentham, 1994) and has been used by others as a competitive inhibitor of CaM (Ciampa et al., 2011; Mercado et al., 2010; Piper and Large, 2004). The third group consisted of cells co-expressing a dominant-negative mutant form of CaM (CaM1234) that does not bind Ca2+ through its N- or C-terminal lobes. Dialysis of MLCKp or co-expression of CaM1234 prevented CaV1.3S-VN and CaV1.3S-VC fusion upon membrane depolarization (Figure 6A–D). Although MLCKp and CaM1234 were equally effective in preventing Venus reconstitution, they had differential effects on ICa inactivation (Figure 6E). Whereas the fraction of peak ICa remaining at 300 ms (r300) in MLCKp-dialyzed cells (0.11 ± 0.03, n = 5) was similar to that of controls (0.14 ± 0.03, n = 5), the rate of inactivation of ICa was slower in cells expressing CaM1234, as reflected in a much higher r300 value (0.75 ± 0.05, n = 5) (Figure 6F). Our interpretation of these findings is that the CaM molecules involved in CDI are distinct from those involved in functional coupling of CaV1.3S channels. The results suggest that CaM molecules that mediate coupling could be both attached to the channels or recruited to the C-terminus during depolarization. This could explain why they are accessible to MLCKp blockade, unlike the CaM molecules that mediate CDI, which are tethered to the IQ domain of the channels (Pitt et al., 2001). 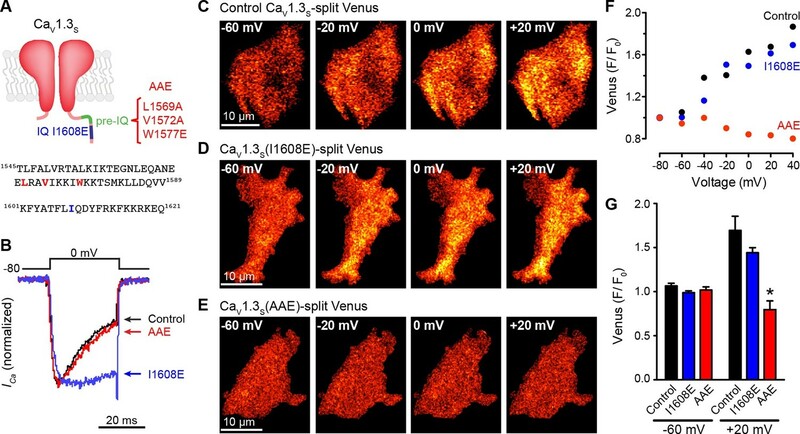 (A–C) TIRF images of Venus fluorescence reconstitution in the presence of 20 mM Ca2+ in tsA-201 cells expressing (A) CaV1.3S-VN and CaV1.3S-VC, (B) CaV1.3S-VN and CaV1.3S-VC and dialyzed with the MLCK peptide (MLCKp), (C) CaV1.3S-VN, CaV1.3S-VC and CaM1234. Fluorescence reconstitution was measured in response to depolarizing voltage steps from a holding potential of -80 mV to test potentials of -60 mV to +60 mV. (D) Voltage-dependence of Venus fluorescence reconstitution in the presence of 20 mM Ca2+ for control (black), MLCKp (blue), and CaM1234 (red) cells shown in (A–C) (left). Bar plot of averaged Venus fluorescence in the presence of 20 mM Ca2+ at -60 mV and +20 mV (right). Bars are averages ± SEM (*p<0.05, n = 5 cells). (E) Normalized ICa currents evoked by a 300-ms depolarizing pulse from a holding potential of -80 mV to a test potential of 0 mV in control (black), MLCKp (blue), and CaM1234 (red) cells. Currents analyzed for these experiments were in a range between 0.3 and 1.2 nA (F) Bar plot of the mean fraction of r300 at 0 mV. Bars are averages ± SEM (*p<0.05, n = 5 cells). (G) Top: TIRF images of CaV1.3S sparklets in tsA-201 cells expressing CaV1.3S-VN and CaV1.3S-VC (Control). Sparklets were recorded at -80 mV in 20 mM Ca2+ before depolarization (left) and after the same depolarization protocol used in (A–C) (right). Green circles indicate sparklet sites. Bottom: Traces of the time course of [Ca2+]i in the corresponding sparklet sites 1 and 2. (H) TIRF images and time course of [Ca2+]i of CaV1.3S sparklets in tsA-201 cells expressing CaV1.3S-VN/CaV1.3S-VC and CaM1234. Format and protocol are as in (G). (I) Bar plot of the averaged CaV1.3S sparklet activity (nPs) before (gray) and after (black) depolarization. Bars are averages 5 cells ± SEM (*p<0.05). To extend this analysis, we recorded CaV1.3S sparklets in control and CaM1234 cells before and after depolarization to +20 mV (Figure 6G and H). Although multi-quantal CaV1.3S sparklets were observed in control cells at rest (e.g., Figure 6G, trace 2 left), sparklets in CaM1234 cells prior to depolarization were long, single-quantal events (Figure 6H, traces 1 and 2, left). These long CaV1.3S sparklets were likely due to decreased CDI of CaV1.3S channels in cells expressing CaM1234 (Yang et al., 2014). Importantly, the overall CaV1.3S sparklet density was lower in cells expressing CaM1234 than WT, suggesting that Apo-CaM does not increase CaV1.3S channel activity. The coupling coefficient for CaV1.3S sparklet sites in WT cells was 0.07 ± 06, whereas that in CaM1234 cells was 0.02 ± 0.02 (n = 5). Membrane depolarization increased the coupling coefficient of CaV1.3S channels within multi-quantal sparklet sites in control cells (0.18 ± 0.03, n = 5), but not in CaM1234 cells (0.08 ± 0.05, n = 5). The opposing effects of CaM1234 on CaV1.3S sparklets — longer, but decoupled — resulted in CaV1.3S sparklet activity before depolarization that was similar in control (nPS = 0.07 ± 0.05; p>0.05) and CaM1234 (nPS = 0.12 ± 0.09) cells (Figure 6I). However, depolarization increased CaV1.3 sparklet activity nearly 7-fold in control cells, but had no effect on sparklet activity in CaM1234 cells. Taken together with the ICa and Venus reconstitution results described above, these data strongly suggest that Ca2+ binding to CaM is required for physical and functional CaV1.3S-to-CaV1.3S channel coupling. Finally, to establish the molecular mechanism by which CaM might mediate these effects, we mutated different CaM-binding domains of the CaV1.3S. L-type channels have two binding sites for CaM in their C-terminus: the IQ domain (aa K1601-Q1621) and the pre-IQ domain (aa T1545-Q1587) (Fallon et al., 2009). These sites have different affinities for CaM; whereas CaM is “pre-associated” and binds tightly to the IQ domain, the association of CaM with the pre-IQ domain is seemingly weaker and likely transient. To determine which of these sites is necessary for CaM-mediated CaV1.3S coupling, we generated two mutants of the CaV1.3S-VN and CaV1.3S-VC channels. The first contained a single point mutation I1608E (CaV1.3-I1608E) that disrupts CaM binding to the IQ domain (Zuhlke et al., 1999), and the second contained a triple mutation (L1569A, V1572A, and W1577E; CaV1.3S-AAE) that prevents CaM binding to the pre-IQ domain and anti-parallel coiled-coil arrangement of the pre-IQ domains (Fallon et al., 2009) (Figure 7A). CaV1.3S-I1608E channels showed a slower rate of inactivation than control and CaV1.3S-AAE channels (Figure 7B), consistent with the lack of CDI. Interestingly, CaV1.3S-I1608E-VN/VC, but not CaV1.3S-AAE VN/VC, which were capable of reconstituting Venus during membrane depolarization (Figure 7C–G). These data suggest that binding of CaM to the pre-IQ domain is critically involved in CaV1.3S channel coupling during membrane depolarization and further supports our previous assertion that the CaM pool involved in CDI is distinct from that involved in channel coupling. The pre-IQ domain is required for Ca2+-CaM-mediated CaV1.3S coupling. (A) Schematic of CaV1.3S mutations introduced to disrupt CaM binding to the IQ (I1608E) or the pre-IQ (AAE) domain; the position of the mutated amino acid is shown in the sequence below. (B) Normalized ICa currents evoked by a 30-ms depolarizing pulse from a holding potential of -80 mV to a test potential of 0 mV in tsA-201 cells expressing CaV1.3S (Control, black), CaV1.3S(I1608E) (blue), or CaV1.3S(AAE) (red). Currents analyzed for these experiments were in a range between 100 and 600 pA (C–E) TIRF images of Venus fluorescence reconstitution in the presence of 20 mM Ca2+ in tsA-201 cells expressing (C) CaV1.3S-VN and CaV1.3S-VC, (D) CaV1.3S(I1608E)-VN and CaV1.3S(I1608E)-VC, or (E) CaV1.3S(AAE)-VN and CaV1.3S(AAE)-VC. Fluorescence reconstitution was measured in response to depolarizing voltage steps from a holding potential of -80 mV to test potentials of -60 mV to +60 mV. (F) Voltage-dependence of Venus fluorescence reconstitution in the presence of 20 mM Ca2+ for control (black), I1608E mutant (blue), and AAE mutant (red) from the cells shown in (C–E). (G) Bar plot of averaged Venus fluorescence in the presence of 20 mM Ca2+ at -60 mV and +20 mV. Bars are averages of 5 cells ± SEM (*p<0.05). We investigated one of the possible molecular mechanisms that prevent functional coupling in CaV1.3L channels. Singh et al (2008) showed that a CaV1.3L mutant lacking the last 116 amino acids of the C-terminus (CaV 1.3L∆116) had voltage-dependencies and kinetics similar to those of CaV1.3S channels. The CaV1.3L∆116 channels lack the distal regulatory domain (DCRD) that binds the proximal regulatory domain (PCRD) located downstream to the pre-IQ and IQ domains of the channel (Figure 8A). Interaction of these two regulatory domains interferes with CaM binding to the IQ domain and results in a reduction in CDI (Bock et al., 2011; Singh et al., 2008). If the DCRD interferes also with the binding of CaM to the pre-IQ domain, which we propose is important for channel-to-channel coupling, we would expect that removing the DCRD would allow coupling between CaV1.3L channels. Thus, we investigated whether or not CaV1.3L∆116 channels are capable of undergoing Ca2+-driven physical interactions. For these experiments, we created CaV1.3L∆116 channels fused to the split Venus system. As expected, CDI of ICa was faster in cells expressing the CaV1.3L∆116 channels compared to the full length CaV1.3L channels (p<0.05; Figure 8B and C). Distal auto-regulatory domain (DCRD) is not responsible for the lack of coupling of CaV1.3L channels. (A) Schematic of CaV1.3L channel splice variant (left), depicting the domains important for Ca2+-mediated regulation: pre-IQ (green), IQ (blue), proximal and distal C-terminal regulatory domains (PCRD, DCRD, gray. Schematic of the CaV1.3LΔC116 channel where the last 116 aa in the C-terminal were removed (right). (B) Representative currents of CaV1.3L (black) and CaV1.3L ΔC116 channels (red) expressed in tsA-201 cells. Currents were evoked by a 300-ms depolarization from holding potential of -80 mV to a test potential of 0 mV, with 2 mM Ca2+ as the charge carrier. Currents analyzed for these experiments were in a range between 0.3 and 1 nA (C) Bar plot of the% inactivation after 25 or 300 ms at 0 mV. Bars are averages of 5 cells ± SEM (*p < 0.001) (D–F) TIRF images of Venus fluorescence reconstitution in the presence of 2 mM Ca2+ in tsA-201 cells expressing CaV1.3S-VN and CaV1.3S-VC (D) CaV1.3L-VN and CaV1.3L-VC (E) or CaV1.3L ΔC116-VN and CaV1.3L ΔC116-VC (E). Fluorescence reconstitution was measured in response to depolarizing voltage steps from a holding potential of -80 mV to test potentials of -60 mV to +60 mV. (G) Bar plot of averaged Venus fluorescence at -60 mV and +20 mV for each of the aforementioned construct pairs. Bars are averages of 5 cells ± SEM (*p<0.05). Data for CaV1.3L ΔC116-VN and CaV1.3L ΔC116-VC Venus reconstitution with 20 mM Ca2+ is presented in Figure 8—figure supplement 1. We found that, with 2 mM Ca2+ in the bathing solution, cells expressing CaV1.3L∆116 channels failed to reconstitute Venus fluorescence, similar to what we observed for the full length CaV1.3L channel (Figure 8D–G). Even increasing the extracellular Ca2+ concentration to 20 mM was not enough to induce coupling in the CaV1.3L∆116 channels (Figure 8—figure supplement 1, n = 5, p=0.245 -60 mV vs 20 mV). This result suggests that deletion of DCRD is not sufficient to allow coupling of CaV1.3L channels. As CaV1.3L∆116 channels still have a C-terminus (396 aa) that is considerably longer than that of CaV1.3S channels, it is possible that another domain inside this region might be responsible for occluding the binding of CaM to the pre-IQ domain, and preventing CaV1.3L∆116 channel coupling. Differential folding between the short and long C-terminal could be another explanation for the ability of CaV1.3S channel-to-channel coupling during depolarization-induced Ca2+ entry. We extended our investigation of the functional consequences of CaV1.3S channel coupling to cultured rat hippocampal neurons. We began by recording spontaneous CaV1.3 sparklets from these cells. As in tsA-201 cells expressing CaV1.3S channels, Ca2+ sparklets in neurons were restricted to specific sites and had multi-quantal amplitudes resulting from the simultaneous opening and closing of multiple channels. The quantal unit of Ca2+ influx was about 40 nM. The coupling coefficient (κ) of sparklet sites ranged from 0.14 to 0.33. The average κ value was 0.23 ± 0.04 (n = 6). Importantly, sparklet site activity was decreased by application of 300 nM of the dihydropyridine antagonist isradipine and completely eliminated when the concentration of the drug was increased to 10 µM (Figure 9A and B). This is consistent with the hypothesis that sparklets in hippocampal neurons were produced by L-type calcium channels. Both CaV1.2 and CaV1.3 channels are expressed in hippocampal neurons (Hell et al., 1993) and although it is impossible to distinguish between these two L-type Ca2+ channels using either electrophysiological or pharmacological methods, it has been shown that CaV1.3 channels have a reduced sensitivity to dihydropyridines compared to CaV1.2 channels (Lipscombe et al., 2004; Xu and Lipscombe, 2001). A previous study by Koschak et al found that 100% of CaV1.2 channels but only ~60% of CaV1.3 channels are inhibited by 300 nM isradipine (Koschak et al., 2001), given this, it is reasonable to assume that any sparklet remaining after application of 300 nM isradipine is more likely to be generated by CaV1.3channels than CaV1.2. In addition, near by 25% of the L-type current in hippocampal neurons is carried by CaV1.3 channels (Moosmang et al., 2005), this proportion is in agreement with the remaining sparklet site density we observed after the treatment with 300 nM isradipine (Figure 9C). Hippocampal neurons exhibit dihydropyridine-sensitive spontaneous persistent sparklet activity that is increased after depolarization. (A) Top: TIRF images of Ca2+sparklets recorded at -80 mV in cultured hippocampal neurons (4 div) under control conditions (20 mM [Ca2+]o; left), and after exposure to low (1 µM; middle) and high (10 µM; right) concentrations of dihydropyridine (DHP). Green circles indicate sparklet sites. Bottom: Traces of the time course of [Ca2+]i at the site indicated by the white arrow for each condition are shown below the relevant image. Dotted red lines show the amplitudes of 1 to 7 quantal levels. (B) Bar chart showing the mean Ca2+ sparklet activity (nPs) in control conditions and after exposure to 300 nM, 1 µM or 10 µM concentrations of DHP. (C) Bar chart showing sparklet density for each condition described in (B) (*p<0.05, n = 6 cells). (D) Top: Ca2+ sparklets recorded at -80 mV in cultured hippocampal neurons (4 div), before depolarization (left) and after depolarization (right). Green circles indicate sparklet sites. Bottom: Traces of the time course of [Ca2+]i in sites 1 and 2 before and after depolarization. (E) Bar plot of the averaged Ca2+ sparklet activity (nPs) before (white) and after depolarization (black). Bars are averages of 4 cells ± SEM (*p<0.05). As was the case for tsA-201 cells expressing CaV1.3S channels, we found that conditioning membrane depolarization to 0 mV increased sparklet activity nearly 3-fold in the hippocampal neurons and induced persistent sparklet activity (Figure 9D and E). The coupling coefficient increased from 0.15 ± 0.04 to 0.43 ± 0.12 after membrane depolarization (n = 8). These results support the hypothesis that L-type channels undergo cooperative gating, generating persistent Ca2+ influx in hippocampal neurons. The persistent L-type channels sparklet activity evoked by membrane depolarization in the presence of Ca2+ bears a striking resemblance to the persistent cationic currents observed in several types of neurons (Fransen et al., 2006; Major and Tank, 2004; Moritz et al., 2007; Powers and Binder, 2001). We found that the somatic and dendritic membranes of neurons expressing both CaV1.3S-VN and CaV1.3S-VC channels displayed prominent Venus fluorescence (Figure 10A), indicating fusion of CaV1.3S-VN and CaV1.3S-VC channel pairs and functional Venus reconstitution. 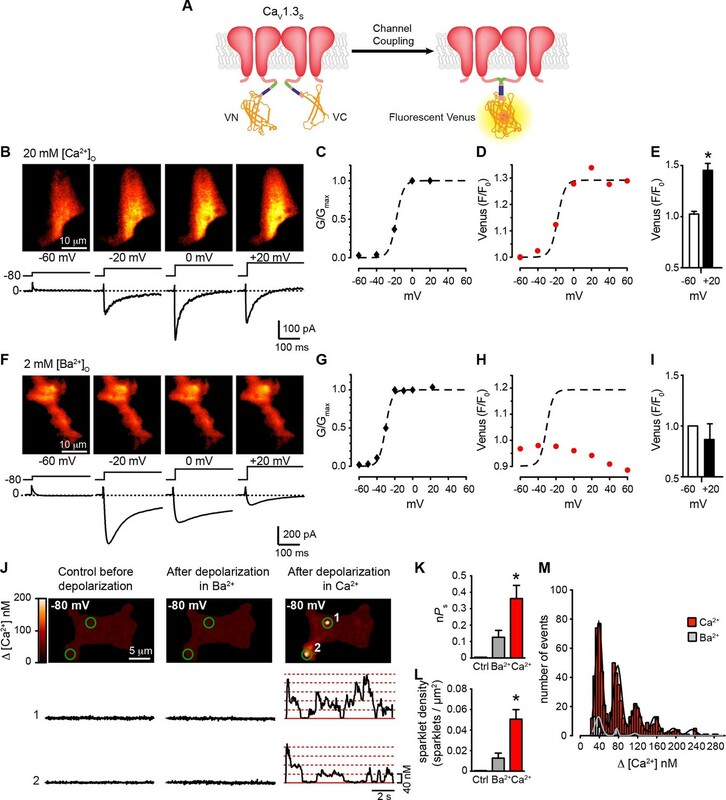 Since Venus reconstitution is irreversible and neurons have spontaneous electrical activity, this observation suggests that the C-termini of CaV1.3S channels make contact during normal neuronal firing. Although spontaneous self-assembly between Venus subunits might conceivably drive an interaction that would not otherwise occur, the improved Venus system used here has a mutation (I152L) that minimizes non-specific interactions (Kodama and Hu, 2010). CaV1.3S coupling increases the firing rate of hippocampal neurons. (A) Confocal images of two representative cultured hippocampal neurons expressing tRFP as a transfection marker (red) and CaV1.3S-VC (left, negative control) or CaV1.3S-VC/CaV1.3S-VN (right). Fluorescence of the spontaneously reconstituted Venus is shown in green. The insets show expanded views of the soma and dendritic regions marked by the dashed boxes. Overexpression of these channels does not change the cluster size observed with super-resolution microscopy (see also Figure 10—figure supplemental 1). (B) Representative traces of spontaneous action potentials recorded from neurons expressing CaV1.3S-CRY2 and CaV1.3S-CIBN before (left) and after (middle) the induction of fusion with 488 nm light and after subsequent treatment with 10 µM nifedipine (right). (C) Bar plot showing the AP frequency (normalized to the peak frequency) for each condition. Bars are averages of 4 cells ± SEM (*p<0.01). We analyzed super resolution images of hippocampal neurons transfected with CaV1.3S-VN and CaV1.3S-VC and found that expression of these channels increased the number of CaV1.3 channel clusters in the cells, but not the size of the clusters (Figure 10—figure supplemental 1). These results indicate that the spontaneous fusion of CaV1.3S channels was not a consequence of their being over-expressed in the plasma membranes of the hippocampal neurons. A testable prediction of these observations is that CaV1.3S channel fusion—forced coupling—should augment the inward ICa and consequently increase neural excitability and firing rate. Figure 10B shows the spontaneous action potentials recorded from a neuron transfected with CaV1.3S-CIBN and CaV1.3S-CRY2, before (right trace) and after (center trace) exposure to 488 nm light. Forced coupling of CaV1.3S-CIBN and CaV1.3S-CRY2 channel pairs increased the average firing rate by about 40% (p<0.01, Figure 10C). 488 nm illumination produced no effect on firing rate in control hippocampal neurons transfected only with CaV1.3S-CIBN channels (0.90 ± 0.04, N = 4). Adding the L-type calcium channel blocker nifedipine 10 μM to the bathing solution abolished all AP activity after light-induced fusion of CaV1.3S-CIBN and CaV1.3S-CRY2 (Figure 10B, left trace and 10C). Together, these results highlight the crucial role that CaV1.3S channels play in regulating the action potential firing in hippocampal neurons. We have found that CaV1.3 channels in the plasma membrane of hippocampal neurons are arranged in clusters containing multiple (~8) channels. This clustering has important physiological consequences for the short-splice variant of the channel (CaV1.3S), enabling proximal channels to engage in cooperative gating, generating more persistent and greater Ca2+ influx. Functional coupling of CaV1.3S channels is promoted by intracellular Ca2+ and involves physical interactions via channel C-termini mediated by physical interactions between Ca2+-CaM and the pre-IQ domain. We propose that Ca2+-driven CaV1.3S channel coupling constitutes a novel feed-forward mechanism for the activation of these channels during membrane depolarization and provides an apparatus for Ca2+-dependent facilitation of inward L-type Ca2+ currents. Further, these findings challenge a fundamental tenet of the classic Hodgkin-Huxley model of ion channel gating: that voltage-gated channels open and close independently. Our data suggest that CaV1.3S channel coupling is critically dependent on intracellular Ca2+ and CaM. During membrane depolarization, CaV1.3S channels open. Ca2+ flowing through these channels creates a local increase in [Ca2+]i — a CaV1.3 sparklet — near the mouth and C-terminus of the channel where the Ca2+-binding protein CaM resides. Upon binding Ca2+, CaM associates with the pre-IQ domain of the channels, enabling the formation of CaV1.3S-CaV1.3S ‘couplets’. The observation of pre-IQ dimers of the structurally similar CaV1.2 channel undergoing coiled-coil interactions in vitro (Fallon et al., 2009) and functionally couples to neighboring channels (Dixon et al., 2015) gives credence to this model. An interesting question suggested by this model is which CaM pool is involved in CaV1.3S channel coupling? The observation that CaM1234 and MLCKp prevent CaV1.3S coupling would suggest that soluble as well as apo-CaM pre-associated with the channel could be involved in inducing physical channel-to-channel interactions. Because physically coupled CaV1.3S channels exhibit higher open probabilities, the overall activity of CaV1.3S channels within a cluster would then depend on the number of channels forming dimers or the probability of the formation of higher order oligomers. A schematic summary of our model is presented in Figure 11. Proposed mechanism for Ca2+-induced functional CaV1.3S coupling in hippocampal neurons. CaV1.3S channels are organized in clusters in the plasma membrane (SM) of hippocampal neurons. At hyperpolarized potentials (e.g., -80 mV), where [Ca2+]i and Po of CaV1.3S channels is very low, the number of coupled channels is very low. Membrane depolarization increases the probability of stochastic (i.e., uncoupled) openings of CaV1.3S channels. 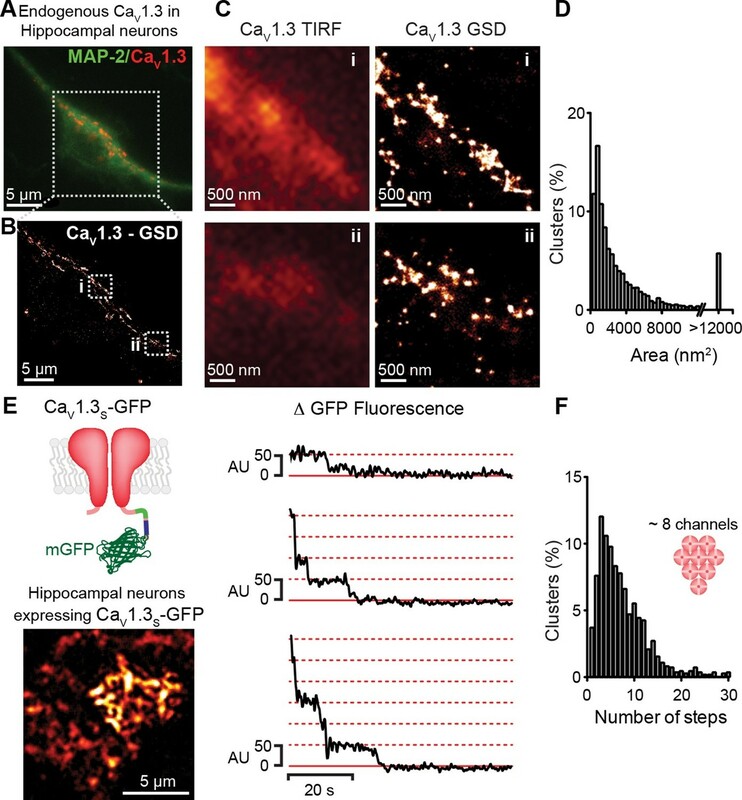 Ca2+ flow through these channels creates a local increase in [Ca2+]i (yellow gradient). This Ca2+ binds to apoCaM, which can be tethered to the pre-IQ domain or soluble in the cytoplasm. Once CaM is activated it promotes channel-channel interaction at the pre-IQ domain. Upon association, the activity of adjoined channels increases, entering into a cooperative gating mode that facilitates Ca2+ influx and underlies the ‘depolarizing drive’ that sustain repetitive firing. It is important to note that Minor and colleagues reported the formation of symmetric dimers of pre-IQ domains bridged by two CaM molecules (Kim et al., 2010). However, they failed to obtain any clustering when the channels were expressed in Xenopus oocytes. The cause for this apparent lack of clustering of CaV1.2 channels in the frog egg are unclear, but suggest that clustering and functional coupling may be features of CaV1 channels expressed only in mammalian cells, as we have shown here for CaV1.3S channels. Our results suggest that while close proximity is necessary, it is certainly not sufficient to allow channel interactions. Super-resolution imaging shows that CaV1.3L and CaV1.3S channels form clusters of similar size along the surface membrane, but CaV1.3L channels, unlike CaV1.3S channels, do not undergo physical and functional coupling. Our experimental results with CaV1.3L∆116 channels open the question as to whether there is another regulatory domain inside the long C-terminus, capable of blocking the interaction of CaM with the pre-IQ domain. These results also suggest that the mechanism allowing neighboring CaV1.3S channels to interact seems to be structural rather than organizational. Although CaV1.3 channels are generally classified as high-voltage activated channels, their lower activation range allows them to generate subthreshold depolarizations that support repetitive firing (Olson et al., 2005). This is in particular true for the short variants of CaV1.3, which are more voltage-sensitive than CaV1.3L channels (Bock et al., 2011; Tan et al., 2011). Our results reveal a new and striking characteristic of CaV1.3S channels: they can coordinate their openings through a physical interaction to facilitate Ca2+ entry at low membrane potentials. In addition, the fact that CaV1.3 channels are clustered in dendritic spines in these neurons (Gao et al., 2006; Jenkins et al., 2010) raises the possibility that their coordinated gating and boosting of Ca2+ entry may have a significant effect on synaptic plasticity. Subthreshold activation of CaV1.3 channels is also a key component of pacemaking and oscillatory behavior in neurons in the brain, such as dopaminergic neurons in the substantia nigra, the principal neurons affected in Parkinson’s disease (Guzman et al., 2009; Puopolo et al., 2007). In this context, it is tempting to speculate that alterations in the cooperative gating of CaV1.3S might contribute to the Ca2+ excitotoxicity observed in multiple pathological conditions, including Parkinson’s neurodegeneration. Future studies should examine the extent to which the cooperative gating of CaV1.3S channels can affect the Ca2+ load in neurons. In summary, our data indicate that Ca2+-driven physical interactions among clustered CaV1.3S channels lead to cooperative gating of these channels and the enhanced Ca2+ influx that underlies the self-sustained firing of hippocampal neurons. It is anticipated that future studies may reveal that cooperative CaV1.3S channel gating plays an important role in pathological conditions such as Parkinson’s disease, spasticity, and memory loss, as well as in physiological functions as diverse as hearing and the modulation of heart rate, where CaV1.3 channels play a key role. Finally, our findings point to a novel, general mechanism for the dynamic modulation of ionic currents through L-type CaV1.3S and CaV1.2 channels. For example, in SA node cells, Ca2+ entry through CaV1.3 and CaV1.2 channels is a key feature in the generation of pacemaker activity (Mangoni et al., 2003; Platzer et al., 2000; Striessnig et al., 2014). In addition, it has been shown in a recent paper that CaV1.3 channels play a critical role in controlling pacemaker activity in SAN cells through the activation of RyR and the triggering of local Ca2+ release from the sarcoplasmic reticulum (SR) (Torrente et al., 2016). The present results suggest a potential new mechanism for Ca2+-dependent control of pacing in these cells. Accordingly, spontaneous junctional SR Ca2+ release events could induce multimerization of nearby CaV1.3S, which, once fused, could produce persistent inward Ca2+ currents that increase the number of RyR activated, thereby driving SA node cells closer to the threshold for action potential generation. The pcDNA clones of the rat CaV1.3 isoforms were obtained from Addgene. We used two Addgene CaV1.3S plasmids#26576 and #49333 (Xu and Lipscombe, 2001), the first one containing two single point substitutions, a glycine by a serine at position 244 and an alanine by a valine at position 1104. We found that they encoded channels with similar voltage-dependencies of activation and rate of activation (Figure 5—figure supplement 2A and B). The CaV1.3S channels encoded by these plasmids were also capable of undergoing Ca2+-dependent dimerization and functional coupling (Figure 5—figure supplement 2C–F). On the basis of these data, we concluded that the G244S and A1104V substitutions in the plasmid #26576 are functionally silent with respect to voltage dependence, rate of activation and have no effect on the capacity of adjacent CaV1.3S channels to undergo allosteric interactions. A prior study by Lieb et al. also reported no contribution of these mutations to the functional properties of CaV1.3S channels (Lieb et al., 2012),. Both plasmids #26576 and #49333 were used to express and design the functional CaV1.3S constructs used in this study. CaV1.3L was also obtained from Addgene (plasmid #49332, (Xu and Lipscombe, 2001)). Auxiliary subunits CaVβ3 and CaVα2δ1 were gift of Dr. Diane Lipscombe’s laboratory; Brown University, Providence, RI). The C-terminus of CaV1.3S andCaV1.3L channels were fused to different proteins depending on the experimental approach. For bimolecular fluorescence complementation, they were fused to either VN or VC fragments of the Venus protein (Kodama and Hu, 2010) (Dr. Chang-Deng Hu, Addgene plasmids 27097, 22011); for photobleaching experiments, they were fused to monomeric GFP (mGFPA206K), amplified from the pCGFP-EU vector (Kawate and Gouaux, 2006), kindly provided by Dr. Eric Goaux (Oregon Health and Science University, Portland, OR); and for the light induced cryptochrome system, they were fused with either CRY2 or CIBN (generous gifts from Dr. Pietro Di Camilli, Yale University, New Haven, CT). The CaM1234 plasmid was a generous gift from Dr. Johannes Hell (University of California, Davis, CA). The tsA-201 cell line, used for heterologous expression of the constructs listed above, was maintained in Dulbecco’s modified Eagle medium supplemented with 10% fetal bovine serum and 1% penicillin/streptomycin antibiotic solution. Cells were transiently transfected using jetPEI transfection reagent (Polyplus Transfection, New York, NY) and plated onto 25-mm coverslips (0.13–0.17-mm thick). Successfully transfected cells were identified on the basis of turbo red fluorescent protein (tRFP) fluorescence. Imaging and electrophysiology experiments were performed within 48 hr of transfection. Hippocampal neurons were prepared from newborn (P1) Sprague-Dawley rats in accordance with University of Washington (UW) guidelines. Animals were decapitated and their tissue harvested according to a protocol approved by the UW Institutional Animal Care and Use Committee (IACUC). The hippocampi of six rat pups were dissected and cut into small pieces in cold dissection medium consisting of 12 mM MgSO4 and 0.3% bovine serum albumen (BSA) in Hank’s balanced salt solution (HBSS). The pieces were incubated for 30 min at 37ºC in dissection medium containing 25 U/ml papain. The digested tissue was washed with warm Neuronal medium consisting of Minimal Essential Medium (MEM) supplemented with 10% horse serum, 2% B27, 25 mM HEPES, 20 mM glucose, 2 mM GlutaMAX, 1 mM sodium pyruvate, and 1% penicillin/streptomycin antibiotic solution. The tissue was then gently homogenized in fresh Neuronal medium using a long Pasteur pipette. Neurons were plated on poly-D-lysine-coated coverslips (0.2 mg/ml for 2 hr) at a density of 2 x 105 cells/coverslip. After incubating neurons at 35ºC for 24 hr, unattached cells were removed by replacing the medium with fresh Neuronal medium. Every 5 day, one-third of the medium was replaced with fresh Neuronal medium supplemented with the anti-mitotic agents fluorodeoxyuridine (20 μM) and uridine (50 μM). After 14 d in culture, rat hippocampal neurons were transfected using 2.4 μg DNA, 4.8 μl of Lipofectamine LTX and 4.8 μl PLUS reagent (Life Technologies, Grand Island, NY) in a final volume of 1 ml of a 1:1 mixture of Neuronal medium and Opti-MEM. After 1 hr of incubation, the medium was replaced with fresh Neuronal medium. Experiments were performed within 48 hr of transfection. Successful transfection was corroborated by detection of tRFP. Ca2+ currents were recorded using the whole-cell configuration of the patch-clamp technique in voltage-clamp mode. Currents were sampled at a frequency of 10 kHz and low-pass filtered at 2 kHz using an Axopatch 200B amplifier. During the experiments, tsA-201 cells were superfused with a solution containing 5 mM CsCl, 10 mM HEPES, 10 mM glucose, 140 mM N-methyl-D-glucamine, 1 mM MgCl2 and 2 mM CaCl2 or 2 mM BaCl2, depending on the experiment. pH was adjusted to 7.4 with HCl. For the experiments using 20 mM CaCl2, the osmolarity was adjusted by decreasing the concentration of NMDG to 113 mM. Borosilicate patch pipettes with resistances of 3–6 MΩ were filled with an internal solution containing 87 mM cesium aspartate (CsAsp), 20 mM CsCl, 1 mM MgCl2, 10 mM HEPES, 10 mM EGTA and 5 mM MgATP, adjusted to pH 7.2 with CsOH. A voltage offset of 10 mV, attributable to the liquid junction potential of these solutions, was corrected offline. Current–voltage relationships were obtained by subjecting cells to a series of 300-ms depolarizing pulses from a holding potential of -80 mV to test potentials ranging from -70 to +50 mV. The voltage dependence of channel activation (G/Gmax) was obtained from the resultant currents by converting them to conductances using the equation, G = ICa/(test pulse potential – reversal potential of ICa); normalized G/Gmax was plotted as a function of test potential. We found that the reversal potential for CaV1.3L (+51 ± 4 mV) and CaV1.3S (+54 ± 3 mV) currents in the presence of 2 mM Ca2+ were not significantly different (p=0.49). The same was true with 2 mM Ba2+ in the bath (CaV1.3L = +60 ± 5 mV; CaV1.3S = +65 ± 2 mV; p=0.31). Thus, while Erev is similar in CaV1.3L and CaV1.3S channels with the same permeating ion, the reversal potential of Ca2+ and Ba2+ currents through these channels differ. In our patch clamp experiments in which the external solution was switched from Ba2+ to Ca2+, 2-min intervals were inserted between the onset of the whole cell configuration to the first pulse and again after switching the external solution, to rule out any effect of the run-up of the ICa (Tiaho et al., 1993). where N is the number of events, a and b are constants, iCa is the amplitude of the current measured and q is the quantal elementary current of the channel. Spontaneous discharge of cultured hippocampal neurons was recorded in current-clamp mode using the perforated-patch configuration. Neurons were superfused with a solution containing 140 mM NaCl, 5 mM KCl, 10 mM HEPES, 10 mM glucose, 1 mM MgCl2, 2 mM CaCl2 and 1 mM Na-pyruvate, adjusted to pH 7.4 with NaOH. Borosilicate patch pipettes with resistances of 3–6 MΩ were filled with an internal solution containing 5 mM NaCl, 140 mM KCl, 15 mM HEPES and 7 mM MgATP, adjusted to pH 7.2 with KOH; 60 μM amphotericin B was added to the solution before starting the recording. Series resistances lower than 30 MΩ were obtained within 5 min of seal formation. The sampling frequency was 10 kHz filtered at 2 kHz. For immunostaining CaV1.3 in tsA-201 cells or hippocampal neurons, cells were fixed by incubating in phosphate-buffered saline (PBS) containing 3% paraformaldehyde and 0.1% glutaraldehyde for 15 min. After washing with PBS, cells were incubated with 50 mM glycine at 4ºC for 10 min (aldehyde reduction), washed again with PBS, and blocked by incubating with 20% SEA BLOCK (Thermo Scientific) and 0.25% v/v Triton X-100 in PBS (blocking buffer) for 1 hr. The cells were incubated overnight at 4ºC with primary antibodies recognizing the residues 809 to 825 located at the intracellular II-III loop of the CaV1.3 channel (DNKVTIDDYQEEAEDKD, rabbit; provided by Drs. William Catterall and Ruth Westenbroek) and the neuronal marker MAP2 (mouse; Abcam), diluted in blocking buffer to a concentration of 10 μg/ml. Cells were then washed with PBS, incubated for 1 hr with Alexa Fluor 647-conjugated donkey anti-rabbit (2 µg/ml; Molecular Probes) and Alexa Fluor 488-conjugated chicken anti-mouse (2 µg/ml; Molecular Probes) secondary antibodies, and washed again with PBS. Our antibody was designed to bind to the intracellular loop linking the 2nd and 3rd membrane domains of CaV1.3. It cannot distinguish between CaV1.3S and CaV1.3L. For super-resolution microscopy, coverslips were mounted on microscope slides with a round cavity using MEA-GLOX imaging buffer (NeoLab Migge Laborbedarf-Vertriebs GmbH, Germany) and sealed with Twinsil (Picodent, Germany). The imaging buffer contained 10 mM MEA, 0.56 mg/ml glucose oxidase, 34 μg/ml catalase, and 10% w/v glucose in TN buffer (50 mM Tris-HCl pH 8, 10 mM NaCl). A super resolution ground-state depletion system (SR-GSD, Leica) based on stochastic single-molecule localization was used to generate super-resolution images of CaV1.3 in hippocampal neurons and tsA-201 cells. The Leica SR-GSD system was equipped with high-power lasers (488 nm, 1.4 kW/cm2; 532 nm, 2.1 kW/cm2; 642 nm, 2.1 kW/cm2) and an additional 30 mW, 405 nm laser. Images were obtained using a 160× HCX Plan-Apochromat (NA 1.43) oil-immersion lens and an EMCCD camera (iXon3 897; Andor Technology). For all experiments, the camera was running in frame-transfer mode at a frame rate of 100 Hz (10 ms exposure time). Fluorescence was detected through Leica high-power TIRF filter cubes (488 HP-T, 532 HP-T, 642 HP-T) with emission band-pass filters of 505–605 nm, 550–650 nm, and 660–760 nm. Super-resolution localization images of CaV1.3 channel distribution were reconstructed using the coordinates of centroids obtained by fitting single-molecule fluorescence signals with a 2D Gaussian function using LASAF software (Leica). A total of 50,000–100,000 images were used to construct the images. The localization accuracy of the system is limited by the statistical noise of photon counting. Thus, assuming the point-spread functions are Gaussian, the precision of localization is proportional to DLR/√N, where DLR is the diffraction-limited resolution of a fluorophore and N is the average number of detected photons per switching event (Dempsey et al., 2011; Folling et al., 2008). Accordingly, we estimated a lateral localization accuracy of 16 nm for Alexa 647 (~1900 detected photons per switching cycle). CaV1.3 cluster size was determined using binary masks of the images in ImageJ software (NIH). The number of CaV1.3S channels in clusters along the surface membrane was estimated using a single-molecule bleaching approach similar to that described by Ulbrich and Isacoff (2007). Briefly, TIRF images of tsA-201 or hippocampal neurons expressing CaV1.3S channels fused to the monomeric GFP were acquired using our Leica GSD microscope in TIRF mode. Cells were fixed with 4% paraformaldehyde for 10 min prior to the acquisition. Images were acquired using an oil immersion 160x objective (NA 1.43) and an Andor iXON EMCCD camera. GFP was excited with a 488 nm laser and image stacks of 2000 frames were acquired at 30 Hz. During analysis, the first 5 images of the stack were averaged and a rolling-ball background subtraction was applied using ImageJ (NIH). This image was then low-pass filtered with a 2 pixel cut-off and high-pass filtered with a 5 pixel cut-off. Thresholding was then applied to identify connected regions of pixels that were above threshold. The ImageJ plugin ‘Time Series Analyzer v2.0’ was used to select 4x4 pixel ROIs, centered on the peak pixel in each spot. These ROIs were used to plot Z-axis intensity profiles (where z is time) of the entire image stack to manually detect the bleaching steps. The spontaneous interaction between the C-terminus of CaV1.3S channels was assessed using the split Venus system (Shyu et al., 2006). In this approach, CaV1.3S channels were fused to either the VN fragments (N1–154) or the VC fragment (C155–238) of the Venus fluorescent protein. The Venus protein emits fluorescence only when the two fragments are close enough to interact and reconstitute the whole protein, providing a measure of the proximity between the C-terminus of the CaV1.3S channels. CaV1.3S -VN and/or CaV1.3S -VC constructs were expressed at a 1:1 ratio in hippocampal neurons; tRFP fluorescence was used as an indicator of successful transfection. Confocal images were acquired with a Fluoview FV1000 microscope (Olympus, Center Valley, PA) equipped with a UPlanS-Apochromat 60× (NA 1.2) water-immersion objective. The Venus protein was excited using a 488 nm laser line. The calcium dependence of CaV1.3 spontaneous interactions was studied in tsA-201 cells expressing CaV1.3S -VC alone or CaV1.3S -VN and CaV1.3S -VC in a 1:1 ratio. Using the whole-cell configuration of the patch-clamp technique, cells were depolarized from a holding voltage of -80 mV to test potentials ranging from -60 to +60 mV, administered as 9-s pulses. Maturation of newly reconstituted Venus protein takes some time, hence the long depolarizing pulse (Nagai et al., 2002). Images were acquired at a frequency of 100 Hz during each depolarizing pulse using a through-the-lens TIRF microscope built around an inverted microscope (IX-70; Olympus) equipped with a Plan-Apochromat (60×; NA 1.49) oil-immersion lens (Olympus) and an electron-multiplying charge-coupled device (EMCCD) camera (iXON; Andor Technology, UK). The last 10 images of each stack were averaged, and total fluorescence was quantified using ImageJ software (NIH). The images were pseudo-colored using the ‘red hot’ lookup table in ImageJ. F0 was calculated by dividing the total fluorescence for each voltage by the initial fluorescence at -80 mV. The change in F/F0 was plotted against voltage and compared to G/Gmax curves constructed as described in the electrophysiology section. The Ca2+ dependence of Venus reconstitution was tested in cells bathed in an external solution containing 20 mM Ca2+ or 2 mM Ba2+. CaV1.3S sparklets were recorded using the TIRF microscopy system described above. [Ca2+]i was monitored by adding the Ca2+ indicator Rhod-2 (200 µM) to the pipette solution and exciting with a 568 nm laser. The much slower Ca2+ buffer EGTA (10 mM) was included with the relatively fast Ca2+ indicator, Rhod-2, to restrict Ca2+ signals to the vicinity of the Ca2+ entry source. Sparklets were detected in tsA-201 cells expressing CaV1.3S channels. The driving force for Ca2+ entry was increased by holding the membrane potential at -80 mV using the whole-cell configuration of the patch-clamp technique. TIRF images were acquired at a frequency of 100 Hz using TILL Image software. Sparklets were detected and analyzed using custom software written in MATLAB (Source code 1). Fluorescence intensity values were converted to nanomolar units as described previously (Navedo et al., 2007). Event amplitude histograms were generated from [Ca2+]i records and fitted with a multicomponent Gaussian function. We determined the activity of sparklets by calculating the nPs of each sparklet site, where n is the number of quantal levels and Ps is the probability that a quantal sparklet event is active. A detailed description of this analysis can be found in Navedo et al. (Navedo et al., 2006). In split Venus experiments, sparklets were acquired at -80 mV before and after a depolarizing protocol from -60 to +60 mV with 9-s pulses. Sparklet images were always acquired in a solution containing 20 mM Ca2+, whereas depolarization protocols were run in 20 mM Ca2+ or 2 mM Ba2+ to compare the effect of Ca2+-dependent CaV1.3S dimerization on sparklet activity. The degree of coupling between CaV1.3 Ca2+ sparklet sites was assessed by further analyzing sparklet recordings using a binary coupled Markov chain model, as first described by Chung and Kennedy (1996) and previously employed by our group (Navedo et al., 2010; Cheng et al., 2011; Dixon et al., 2012). The custom program (Source code 2), written in the MATLAB language, assigns a coupling-coefficient (κ) to each record, where κ can range from 0 (purely independently gating channels) to 1 (fully coupled channels). Elementary event amplitudes were set at 38 nM. Light-induced dimerization of CaV1.3 channels was accomplished by fusing CaV1.3 channels with the optogenetic light-induced dimerization system based on CRY2 and CIB1 proteins of Arabidopsis thaliana (Kennedy et al., 2010). Upon blue-light illumination (488 nm), CRY2 absorbs a photon, causing a conformational change in one of its domains that promotes binding to the N-terminal region of CIB1 (CIBN). CaV1.3-CIBN and/or CaV1.3-CRY2 constructs were expressed in a 1:1 ratio in hippocampal neurons. Forty-eight hours after transfection, spontaneous action potential firing was recorded in current-clamp mode. One minute after initiating recordings, neurons were exposed to a 30-s blue light pulse to induce dimerization, and the changes in the firing pattern were measured. In tsA-201 cells, Ca2+ currents were recorded before and after light illumination in response to a 20-ms depolarizing pulse at +10 mV from a holding potential of -80 mV. Experiments were performed on a Nikon (Eclipse TE2000-S) Swept Field confocal system controlled with Elements software and equipped with a 488 nm laser line and a Plan Apo 60× 1.45 N.A. oil-immersion objective. Data were collected from at least five independent experiments in each series. The data included in this paper were normally distributed. Accordingly, parametric statistics were performed and mean ± SEM are used to provide a description of the data set. Student’s t-test was used to test for statistical significance using Prism 5.0 a software (GraphPad software Inc. La Jolla, CA). We decided, a priori, that p values <0.05 were indicative a statistical significance difference between or among data groups. The number of cells used for each experiment and p values are detailed in each figure legend. Paired t- tests were used to test for statistical significance of paired observations. Comparisons between three or more conditions were made by one-way ANOVA test using Prism software. The Journal of Biological Chemistry 286:4141–4149. Proceedings of the National Academy of Sciences of the United States of America 102:433a–1754. Proceedings of the National Academy of Sciences of the United States of America 106:5135–5140. The Journal of Neuroscience 26:6259–6268. The Journal of Neuroscience 29:11011–11019. The Journal of Cell Biology 123:949–962. The Journal of Cell Biology 171:537–547. The Journal of Neuroscience 30:5125–5135. The Journal of Biological Chemistry 276:22100–22106. Proceedings of the National Academy of Sciences of the United States of America 100:5543–5548. The Journal of Neuroscience 30:13338–13347. The Journal of Neuroscience 25:9883–9892. American Journal of Physiology. Heart and Circulatory Physiology 293:H1359–1370. The European Journal of Neuroscience 19:2109–2122. The Journal of Neuroscience 25:1050–1062. The Journal of Physiology 559:449–457. The Journal of Biological Chemistry 276:30794–30802. The Journal of Neuroscience 27:645–656. The Journal of Physiology 591:4793–4805. The Journal of Physiology 463:367–389. Proceedings of the National Academy of Sciences of the United States of America 91:9659–9663. The Journal of Neuroscience 21:5944–5951. The American Journal of Physiology 267:H982–993. The Journal of Neuroscience 23:2538–2548. The required revisions should be easily accomplished and are detailed in the individual reviews below. Introduction: As mentioned in my previous comments, the Chan et al. paper should not be cited in the context of pacemaking in dopamine neurons because their role for pacemaking as described in this paper has been corrected in a second paper by the same authors. In the first paragraph it therefore would make sense to replace the Chan et al. reference by their Guzman et al., 2009 reference. In the third paragraph "drive the" should be replaced by "support". Also here the Chan reference should be replaced by Guzman. In the third paragraph of the Introduction and in the first paragraph of the subsection “Coupling of CaV1.3S channels increases the firing rate of hippocampal neurons”: The estimated fraction of CaV1.3 channels in hippocampal neurons is 20%: total 22.3% of current; 4.4% remaining in CaV1.2 knockout (Moosmang paper). In the second paragraph of the subsection “A Ca2+-dependent mechanism mediates facilitation of CaV1.3S, but not CaV1.3L, channels”: The authors should somehow make clear what leads them to conclude opening of 2 and more channels. I assume they derive this interpretation from the double (multiple) amplitudes of unitary currents. However, it also could be that smaller unitary currents represent subconductance states of a channel. A clarifying sentence would make sense here. Also: "the frequency of currents…is higher…(Figures 1C-F)”. How is this difference between the splice variants quantified ("higher"); statistics (if "higher" is significant) should be provided here. In the third paragraph of the subsection “A Ca2+-dependent mechanism mediates facilitation of CaV1.3S, but not CaV1.3L, channels”: "We found that Ca2+ ions entering the cell through the channels increased the NPo nearly 1.5-fold for CaV1.3S channels". I assume the authors have done the controls showing that run-up during the experiment and during switching from equilibrium in Ba- to Ca-containing solutions cannot explain the increased CaV1.3S current. This information should be provided (e.g. in the Methods section). Based on their experimental conditions channels and channel clusters (fluorescence or antibody stained) they analyze in tsA-201 cells and neurons must reflect both intra- (unlikely functional) and plasmalemmal (surface, i.e. functional) channel complexes. In the absence of other evidence this limitation should be mentioned in the Results section. In the subsection “Physical interaction between CaV1.3S channels induces ICa facilitation”: I assume paired t-test or Wilcoxon test has been used for calculating statistics of paired observations. Use of this test should be indicated also in the statistics section of the Methods part. In the fifth paragraph of the Discussion: Also long CaV1.3 splice variants activate more negative that any CaV1.2 splice variant characterized so far. Therefore it would be clearer to state, e.g. : Although CaV1.3 channels are generally classified as high-voltage activated channels, their lower activation range allows them to generate subthreshold depolarizations that support repetitive firing (Olson et al., 2005). This is in particular true for short splice variants which are even more voltage-sensitive than CaV1.3L (Bock et al., 2011; Tan et al., 2001-PMID 21998309). Note that the voltage-sensitivity is changed between long and short forms, i.e. the coupling of voltage-sensor movements to channel opening (Lieb et al., 2014; C-terminal modulatory domain controls coupling of voltage-sensing to pore opening in CaV1.3 L-type Ca(2+) channels). Please replace Xu and Lipscombe here. These authors actually generated the corrupted CaV1.3L variant that was originally used in this paper. Therefore they could never detect the difference between CaV1.3S and CaV1.3L. Cite the Soong group here instead. In the subsection “Plasmid constructs and tsA-201 cell transfection”: The #26576 must differ from the #49333 plasmid not only at position 244 (G244S) but also should contain a non-natural substitution at position 1104 (A1104V). This is not discussed by the authors. However, this is as relevant as G244S for interpreting their results. However, the effects of these substitutions have been characterized in detail in an earlier publication (Lieb et al., 2012; PMID 22760075). Based on these findings a contribution of this substitution to the function of CaV1.3 is unlikely. If this substitution is indeed present in their cDNA they should mention this and cite the above paper in the Methods part. New CaV1.3L experiments have been performed months after most of the CaV1.3S experiments shown. Have the authors also confirmed the persistence of the differences in parallel experiments with CaV1.3S when new CaV1.3L data were generated? The authors have been responsive to the previous critiques, and the manuscript is improved. Overall, the work is pretty convincing and I believe that it makes a valuable contribution to the CaV channel literature. There are still a few points that need further clarification. 1) Results: "Interestingly, we found that the frequency of currents resulting from the simultaneous opening of 2 or more channels is higher for CaV1.3S than CaV1.3L channels when Ca2+ is the charge carrier (Figures 1C- F)." This certainly seemed the case in the first version of the manuscript but is not obvious to me from the data provided in the revised manuscript. The authors should either provide more quantitative information to back up this statement or remove it. 2) Results: "This assumption is reasonable, as we found no significant difference in the activation time constants for CaV1.3L and CaV1.3S currents that were 1.60 ± 0.22 and 1.17 ± 0.051 ms (-10 mv), respectively." Please provide n and P values for the statistical analyses. 3) Sparklet data shown in Figures 2, 5 and 6 have not changed from previous version, yet now they are labeled as being recorded at -80 mV whereas the original version had them recorded at -70 mV. Which one is correct? 4) Results: "We found that, with 2 mM Ca2+ in the bathing solution, cells expressing CaV1.3LΔ116 channels failed to reconstitute Venus fluorescence, similar to what we observed for the full length CaV1.3L channel (Figure 8D-8G)." Experiment should be done with 20 mM Ca2+ to mimic conditions used for CaV1.3S in Figures 5and 6. The failure to observe CaV1.3LΔ116 reconstitution of Venus fluorescence could be simply due to the 10-fold less extracellular Ca2+ used in this experiment. If so, this would change the conclusion reached for this experiment. 5) Discussion: "An intriguing observation in our study is that physical CaV1.3S channel coupling (assessed by Venus reconstitution) and the normalized conductance of ICa (i.e., G/Gmax) have similar voltage dependencies. We propose that this is a consequence of two factors. First, Venus fluorescence (i.e., reconstitution) and CaV1.3S conductance have similar sigmoidal relationships suggesting that CaV1.3S coupling is primarily determined by the open probability of these channels. This is consistent with our model, as the extent of Venus reconstitution depends on the local calcium concentration produced by the coordinated opening of clustered channels and less on magnitude of the flux through individual channels. The second factor contributing to the shared voltage dependencies is the irreversible nature of the Venus reconstitution, resulting in an increased number of fluorescent proteins with each successive depolarization as the open probability of CaV1.3S channels increases." These lines should be removed as they represent an over-interpretation of the data. As the authors note in their second point, the sigmoidal nature of the Venus reconstitution dependence on voltage most likely reflects the irreversible nature of the Venus reconstitution such that fluorescence accumulates with successive depolarizations. I suspect if the experiments were done in reverse (i.e., test pulses stepping down from +60 mV to -60 mV) that the relationship would also show a sigmoidal relationship but with the fluorescence lower at the higher voltages where channel Po is higher. This thought experiment suggests the idea that "…CaV1.3S coupling is primarily determined by the open probability of these channels…" is an oversimplification. 6) Please include the procedures for single-channel recordings in the Methods. The single channel traces appear to have quite long openings (particularly for the Ba2+ traces; Figure 1—figure supplement 1). Was an L-type channel agonist included for these experiments? If so this should be explicitly stated in the Methods. Thank you for choosing to send your work entitled "Ca2+ entry into neurons is facilitated by cooperative gating of clustered CaV1.3 channels" for consideration at eLife. Your full submission has been evaluated by Eve Marder (Senior editor), Richard Aldrich (Reviewing editor), and two peer reviewers, one of whom, Jorg Striessnig, has agreed to reveal his identity. The decision was reached after discussions between the reviewers. Based on our discussions and the individual reviews below, we regret to inform you that your work will not be considered further for publication in eLife. While we are enthusiastic about the work, significant concerns about the appropriateness of the particular constructs used, as detailed in the enclosed reviews, preclude us from accepting the manuscript, or asking for a straightforward revision. eLife's policy is to reject papers rather than ask for extensive new work. However, if you do the work with the appropriate constructs, we would welcome a new submission. In that case, please indicate in your cover letter that you would like the same BRE member and potentially reviewers (although we can make no promises) to look at it. Of course, if you do not agree with the reviewers, you are welcome to submit this manuscript elsewhere, as it is no longer in consideration at eLife. This paper follows up on intriguing work from the Santana lab suggesting that Ca2+ influx through L-type CaV1.2 channels promotes a Ca2+-CaM dependent physical coupling of two or more channels through the C-termini of the pore-forming alpha1C subunit. This physical coupling leads to co-operative opening of the channels and facilitates Ca2+ influx. Here they extend this analyses to CaV1.3 channels and observe the same phenomenon in a CaV1.3 short but not CaV1.3 long splice variant. They further suggest that this phenomenon occurs and contributes to excitability in hippocampal neurons. The work is impressive in the amount of different techniques and experiments the authors bring to bear on the question at hand. If correct, this would certainly be an important contribution to the literature on gating mechanisms and physiological regulation of L-type channels. However, in its current form the work has a number of inconsistencies and issues with interpretation of the data that significantly weaken the strength of the overall conclusions. Given that this work adheres closely to previously published work on CaV1.2 it is my opinion that the presentation here should go substantially beyond the phenomenology of the observation and provide a more rigorous mechanism for the effect. 1) Single channel traces with Ca2+ as charge carrier show no signature of Ca2+-dependent inactivation despite this being so prominent in whole-cell currents (Figure 1A-1D). Why is this? The authors should provide ensemble averages of the single channel data to increase confidence that the unitary currents actually correspond to CaV1.3. 2) A central point of the paper is that CaV1.3s but not CaV1.3L displays the phenomenon of Ca2+-induced channel coupling and facilitation. Ultimately, this is attributed the distal C-terminus competing away CaM binding to the channel. However, the CaV1.3L used in the paper demonstrates quite a robust CDI (e.g. Figure 1A, B), indicating that CaM is bound to the channel. The comparable CDI between CaV1.3s and CaV1.3L observed in the paper is likely due to the use of the rat clones which are known to display similar CDI at ambient CaM concentrations (Yang et al., 2006, J. Neurosci. 26:10677-89). This is because the rat CaV1.3L has a point mutation relative to the human clone, which weakens its affinity for the CaM-binding domain such that ambient CaM is sufficient to (by competition) access its site on the channel (Liu et al., 2010, Nature, 463:968-973). Given this, it is unclear why CaV1.3L would lack the Ca2+-dependent facilitation described here. At the very least the interpretation that this due to CaM being excluded from these channels is not supported? 3) What is the kinetics of the facilitation? Figures 1A and 1B suggest it occurs immediately upon channel activation within 1 ms. This seems very fast for the inter-molecular binding mechanism proposed in Figure 10. Also, how fast does the system reset after closing the channel? 4) Does CaM1234 prevent the facilitation observed with CaV1.3s in whole-cell currents (i.e. what does Figure 1A, B look like with CaM1234)? 5) Light-induced dimerization experiments in Figure 4. Seems to me that these experiments should be done with Ba2+ and not Ca2+ as charge carrier? If idea is the dimerization is sufficient to induce facilitation, having Ca2+ also present complicates the interpretation. 6) What is the CaM that actually produces the proposed channel coupling? The ability of CaM1234 to prevent facilitation would suggest that apoCaM preassociated with the channel is responsible. However, the effectiveness of MLCKp suggests a soluble CaM. If both of these are true then it is inconsistent with the simple model proposed in Figure 10. The authors need to provide a model that fits all the facts they present. 7) Figure 6: Is the increase in firing rate decreased by L-type channel antagonists? In their manuscript, Moreno and colleagues extend their previous finding (published in eLife) of cooperative gating of CaV1.2 voltage gated Ca2+ channels to structurally and functionally highly related CaV1.3 channels. As for CaV1.2 in cardiomyocytes they made a big effort in using a battery of experimental paradigms to demonstrate calmodulin-dependent physical coupling leading to higher open probabilities in tsA-201 cells and hippocampal neurons. Their findings contrast with the current view of independent gating of CaV-channels. By discovering a novel modulatory mechanism this paper is potentially very important to advance calcium channel research. The paper is clearly written, well-illustrated and of appropriate length. 1) The authors describe the use of the CaV1.3 alpha1 rat constructs Addgene plasmid 26577 (long) and 26576 (short). This selection is very unfortunate. Both constructs contain a number of mutations originally introduced by cloning the full-length alpha1-subunits. Addgene (meanwhile?) also provides the corrected versions (plasmids 49332 and 49333). Unfortunately, the mutations are not functionally silent. The Yue group (Liu et al. Cell, 2010) reported that one of the mutations (Val to Ala in ICDI) disrupts the function of a distal modulatory domain (ICDI, also termed DCRD; a finding later confirmed by others: Huang et al. Mol Pharmacol, 2013; Lieb et al., Biophys J 2014). Since this domain competitively tunes the interaction of calmodulin with its upstream binding sites (pre-IQ, IQ) the long mutant CaV1.3 channel behaves functionally more like short splice variants (that lack ICDI due to splicing), with higher CDI and higher open probability, properties that are crucial for the interpretation of the author's data. The authors should have been aware of this because the difference between Ca2+ current inactivation of their CaV1.3L and CaV1.3S and between CaV1.3L and CaV1.3delta116 was much smaller than expected between rat (and human) CaV1.3L and CaV1.3S variants (shown in many publications e.g. by the groups of Yue, Soong, and Striessnig). To get around this problem, at least some key experiments affected by the use of mutant constructs should be repeated with their corrected counterparts, in particular those involving Ca2+ signals generated by the long isoform (Figure 1., Figure 2, Figure 4). This is justified due to the lower open probability and less pronounced CDI expected for the corrected (wildtype) rat CaV1.3L construct. Although there are also good arguments to repeat all other experiments with the correct constructs, the authors should be able to provide convincing arguments that this is not necessary, e.g. by discussing that CDI does not seem to be a determinant for coupling (Figure 7E). 2) Evidence for the specificity of staining of endogenous CaV1.3 alpha1 subunits in hippocampal neurons should be provided. So far no CaV1.3 antibody staining has been reported in hippocampal neurons or brain sections that was shown to be absent in CaV1.3 knockout controls. I would therefore not be surprised if this is also true for their antibody. If there is no evidence for such convincing specificity, the authors should either remove data showing staining of native channels or clearly state this caveat in their paper. Obviously, they cannot be blamed for the fact that no anti-CaV1.3 antibody with proven specificity exists. In any case, they should show the typical somatodendritic clusters also on spines of their CaV1.3 constructs transfected in hippocampal cultures using high resolution light microscopy as has been shown in previous work (e.g. Jenkins et al., J Neurosci, 2010). 3) In the subsection “Coupling of CaV1.3S channels increases the firing rate of hippocampal neurons”: According to Moosmang et al. (2005; PMID: 16251435), CaV1.3 current components are minimal in hippocampal neurons and L-type currents seem to comprise only a small fraction of total voltage-gated calcium current. So how do the authors know their sparklets are produced by L-type currents? If so, they should vanish after treatment with a dihydropyridine Ca2+ channel blocker. This important control appears to be missing in the manuscript. They should also consider that there is no way to distinguish between CaV1.3 and CaV1.2 sparklets (not even by membrane voltage as stated in their manuscript). The authors have done a remarkable job in revising their manuscript. There are only a few issues remaining: Introduction: As mentioned in my previous comments, the Chan et al. paper should not be cited in the context of pacemaking in dopamine neurons because their role for pacemaking as described in this paper has been corrected in a second paper by the same authors. In the first paragraph it therefore would make sense to replace the Chan et al. reference by their Guzman et al., 2009 reference. In the third paragraph "drive the" should be replaced by "support". Also here the Chan reference should be replaced by Guzman. We thank the reviewer for the clarification. As suggested, we replaced the references where indicated. In the third paragraph of the Introduction and in the first paragraph of the subsection “Coupling of CaV1.3S channels increases the firing rate of hippocampal neurons”: The estimated fraction of CaV1.3 channels in hippocampal neurons is 20%: total 22.3% of current; 4.4% remaining in CaV1.2 knockout (Moosmang paper).We thank the reviewer for the comment and have added that information to the manuscript (Introduction, third paragraph). We recognize that this analysis was not clearly described in the Methods section of the previous version of the manuscript. Briefly, we generated all-points histograms from our cell-attached patch-clamp recordings. These histograms were fit with a multi-Gaussian function that included a quantal (q; i.e., elementary current) parameter. This equation is included in the Methods section (subsection “Electrophysiology”) and the parameters used are included in the legend of Figure 1. In the presence of 20 mM Ca2+, our analysis revealed that the amplitude of the elementary current (i.e., q) was -0.48 ± 0.07 pA and -0.49 ± 0.01 pA for CaV1.3L and CaV1.3S channels at -30 mV, respectively. Our qCa is similar to previously reported values (Guia et al., 2001). This is now clarified in the Results. During analysis, the number of channel opening associated with a cell-attached current would be equal to the current amplitude divided by the corresponding qvalue (i.e., qCa ± SD). We recognize that CaV1.3S and CaV1.3L channels could potentially open in sub-conductance states (McDonald et al., 1994). However, we did not observe intermediate peaks between the current levels expected for sets of fully conducting channels. Thus, we concluded that the values reported correspond to the quantal values of the unitary current rather than to any sub-conductance state and that the double and multiple amplitudes of the currents correspond to the simultaneous opening of 2 or more channels. “These data suggest that the difference observed in the macroscopic currents between the CaV1.3L and CaV1.3S channels is not due to differences in unitary currents”. In the third paragraph of the subsection “A Ca2+-dependent mechanism mediates facilitation of CaV1.3S, but not CaV1.3L, channels”: "We found that Ca2+ ions entering the cell through the channels increased the NPo nearly 1.5-fold for CaV1.3S channels". I assume the authors have done the controls showing that run-up during the experiment and during switching from equilibrium in Ba- to Ca-containing solutions cannot explain the increased CaV1.3S current. This information should be provided (e.g. in the Methods section). The reviewer raises an important point regarding the ‘run-up’ of Ca2+ currents. L-type Ca2+ currents typically reach their run-up peak after 2 minutes (Tiaho et al., 1993). In the patch-clamp experiments in which the external solution was switched from Ba2+ to Ca2+, 2-minute intervals were inserted between the onset of the whole cell configuration to the first pulse and again after switching the external solution to rule out any effect of the run-up of the ICa. This is now clarified in the Methods section of the paper (subsection “Electrophysiology”, first paragraph). Based on their experimental conditions channels and channel clusters (fluorescence or antibody stained) they analyze in tsA-201 cells and neurons must reflect both intra- (unlikely functional) and plasmalemmal (surface, i.e. functional) channel complexes. In the absence of other evidence this limitation should be mentioned in the Results section. For both the super-resolution and photobleaching experiments, we used TIRF microscopy with a penetration depth of about 130 nm to restrict imaging to a thin optical section near the plasma membrane. This is now mentioned in the revised manuscript (subsection “CaV1.3 channels in hippocampal neurons aggregate in dense clusters”, third paragraph). In the subsection “Physical interaction between CaV1.3S channels induces ICa facilitation”: I assume paired t-test or Wilcoxon test has been used for calculating statistics of paired observations. Use of this test should be indicated also in the statistics section of the Methods part. A paired t-test was indeed used to test for statistical significance of paired observations as now noted in the Data analysis section. Note that the voltage-sensitivity is changed between long and short forms, i.e. the coupling of voltage-sensor movements to channel opening (Lieb et al., 2014; C-terminal modulatory domain controls coupling of voltage-sensing to pore opening in CaV1.3 L-type Ca(2+) channels). Please replace Xu and Lipscombe here. These authors actually generated the corrupted CaV1.3L variant that was originally used in this paper. Therefore they could never detect the difference between CaV1.3S and CaV1.3L. Cite the Soong group here instead. We agree with the reviewer that CaV1.3L also activates at more negative voltages than CaV1.2 and that we need to clarify that the short variant Cav1.3Schannelsare even more voltage sensitive. We have modified the text and the references as suggested by the reviewer (Discussion, fifth paragraph). In the subsection “Plasmid constructs and tsA-201 cell transfection”: The #26576 must differ from the #49333 plasmid not only at position 244 (G244S) but also should contain a non-natural substitution at position 1104 (A1104V). This is not discussed by the authors. However, this is as relevant as G244S for interpreting their results. However, the effects of these substitutions have been characterized in detail in an earlier publication (Lieb et al., 2012; PMID 22760075). Based on these findings a contribution of this substitution to the function of CaV1.3 is unlikely. If this substitution is indeed present in their cDNA they should mention this and cite the above paper in the Methods part. We agree. The plasmid we used contained the two mutations as is now stated in the Methods section (subsection “Plasmid constructs and tsA-201 cell transfection”). In Figure 5—figure supplement 2 and the corresponding legend, CaV1.3S(G244S) has been replaced by (CaV1.3S(G244S/A1104V)). We have also noted that a previous study by Lieb et al. (Lieb et al., 2012), found that these mutations did not alter the function of CaV1.3S channels (Line 555). New CaV1.3L experiments have been performed months after most of the CaV1.3S experiments shown. Have the authors also confirmed the persistence of the differences in parallel experiments with CaV1.3S when new CaV1.3L data were generated? All of the additional experiments performed with the new CaV1.3L were complemented by parallel experiments on the previously used CaV1.3S channels to confirm the absence of coupling for the CaV1.3L. In addition, split Venus and sparklets experiments for the CaV1.3L were run in parallel with those for the new CaV1.3S (Data for the short isoform is presented on Figure 5—figure supplement 2). Further, parallel single channel experiments, whole-cell ICa and NPo analysis were also performed for the new CaV1.3L and CaV1.3S channels. The authors have been responsive to the previous critiques, and the manuscript is improved. Overall, the work is pretty convincing and I believe that it makes a valuable contribution to the CaV channel literature. There are still a few points that need further clarification. 1) Results: "Interestingly, we found that the frequency of currents resulting from the simultaneous opening of 2 or more channels is higher for CaV1.3S than CaV1.3L channels when Ca2+ is the charge carrier (Figures 1C- F)." This certainly seemed the case in the first version of the manuscript but is not obvious to me from the data provided in the revised manuscript. The authors should either provide more quantitative information to back up this statement or remove it. Please see our response above (“We thank Reviewers 1 and 2 for pointing this out […]). 2) Results: "This assumption is reasonable, as we found no significant difference in the activation time constants for CaV1.3L and CaV1.3S currents that were 1.60 ± 0.22 and 1.17 ± 0.051 ms (-10 mv), respectively." Please provide n and P values for the statistical analyses. We had a sample size of 6 for each channel in these experiments. The p value was 0.112. This information has been added to the text (subsection “A Ca2+-dependent mechanism mediates facilitation of CaV1.3S, but not CaV1.3L, channels”, last paragraph). 3) Sparklet data shown in Figures 2, 5 and 6 have not changed from previous version, yet now they are labeled as being recorded at -80 mV whereas the original version had them recorded at -70 mV. Which one is correct? We thank the reviewer for the comment. -80 mV is the correct voltage. In the revised version of the manuscript, we have corrected the values for a liquid junction potential offset of 10 mV. On the previous version, we had not done so which is why all the sparklet figures were labeled with -70 mV. As all of the electrophysiology data presented were corrected for the LJP, we decided to correct sparklet data as well. 4) Results: "We found that, with 2 mM Ca2+ in the bathing solution, cells expressing CaV1.3LΔ116 channels failed to reconstitute Venus fluorescence, similar to what we observed for the full length CaV1.3L channel (Figure 8D-8G)." Experiment should be done with 20 mM Ca2+ to mimic conditions used for CaV1.3S in Figures 5 and 6. The failure to observe CaV1.3LΔ116 reconstitution of Venus fluorescence could be simply due to the 10-fold less extracellular Ca2+ used in this experiment. If so, this would change the conclusion reached for this experiment. The reviewer raises an important point about the possibility that increasing extracellular Ca2+ concentration to 20 mM could induce CaV1.3LΔ116 coupling. We had performed the experiments using 20 mM Ca2+ previously and did not observe any increase in Venus reconstitution for the CaV1.3LΔ116. The reason we did not include those data in the revised manuscript is because if removing the C116 fragment were to generate a channel capable of coupling, we should be able to discern Venus reconstitution even at 2 mM Ca2+, as was true for the CaV1.3S (Figure 8D and Figure 5—figure supplement 1). Nonetheless, for clarity we now added a new supplemental figure to the revised manuscript displaying these data (Figure 8—figure supplement 1). The new Figure is referred to in the last paragraph of the subsection “Deletion of DCRD is not sufficient to allow coupling in CaV1.3L channels”. 5) Discussion: "An intriguing observation in our study is that physical CaV1.3S channel coupling (assessed by Venus reconstitution) and the normalized conductance of ICa (i.e., G/Gmax) have similar voltage dependencies. We propose that this is a consequence of two factors. First, Venus fluorescence (i.e., reconstitution) and CaV1.3S conductance have similar sigmoidal relationships suggesting that CaV1.3S coupling is primarily determined by the open probability of these channels. This is consistent with our model, as the extent of Venus reconstitution depends on the local calcium concentration produced by the coordinated opening of clustered channels and less on magnitude of the flux through individual channels. The second factor contributing to the shared voltage dependencies is the irreversible nature of the Venus reconstitution, resulting in an increased number of fluorescent proteins with each successive depolarization as the open probability of CaV1.3S channels increases." These lines should be removed as they represent an over-interpretation of the data. As the authors note in their second point, the sigmoidal nature of the Venus reconstitution dependence on voltage most likely reflects the irreversible nature of the Venus reconstitution such that fluorescence accumulates with successive depolarizations. I suspect if the experiments were done in reverse (i.e., test pulses stepping down from +60 mV to -60 mV) that the relationship would also show a sigmoidal relationship but with the fluorescence lower at the higher voltages where channel Po is higher. This thought experiment suggests the idea that "…CaV1.3S coupling is primarily determined by the open probability of these channels…" is an oversimplification. We agree that the sigmoidal nature of the Venus reconstitution dependence on voltage is likely to be a consequence of the irreversibility of Venus reconstitution as we have stated. Accordingly, we removed the discussion of the relationship between physical CaV1.3S channel coupling and the Po of clustered channels. We have also moved our explanation of Venus reconstitution irreversibility to the Results section, since we consider this information essential in following the inferences we draw from our data (subsection “CaV1.3S channels couple under membrane depolarization in a Ca2+-dependent manner”, second paragraph). We thank the reviewers and editors for their thoughtful comments on our work and for giving us the opportunity to submit a revised version of the manuscript. Indeed, we are particularly grateful for alerting us to the mutations contained in the plasmids we used to generate the CaV1.3L and CaV1.3S channels that we were completely unaware of. As a consequence, we have repeated virtually all of our experiments and analyses using the corrected versions of the channels. The new manuscript contains a total of 16 new sets of experiments that address the reviewers comments. The paper is re-submitted nearly nine months after receiving the first round of reviews because the list of necessary experiments was long. That said, we believe the new data were important and think that they have significantly strengthened and improved the paper. 1) Single channel traces with Ca2+ as charge carrier show no signature of Ca2+-dependent inactivation despite this being so prominent in whole-cell currents (Figure 1A-1D). Why is this? The authors should provide ensemble averages of the single channel data to increase confidence that the unitary currents actually correspond to CaV1.3. We thank the reviewer for bringing up this important point. We have added new single channel recordings from cells expressing the corrected forms of CaV1.3L and CaV1.3S channels in the revised manuscript (Figure 1C-D). As requested, we also generated ensemble currents from these recordings (see new Figure 1G). CaV1.3S and CaV1.3L currents were rapidly activated by depolarization and then inactivated likely due to Ca2+ and voltage-dependent mechanisms. f) When fused to the split Venus system, the CaV1.3L channels failed to reconstitute Venus fluorescence after depolarization (see new Figure 8E). The only difference observed between CaV1.3L and the previously used CaV1.3L(V2075A) was that, after removing the DCRD domain, the CaV1.3L∆116 channels were still unable to couple (see new Figure 8). The answer to the question of why the CaV1.3L(V2075A) is able to couple when the DCRD is removed is still unclear to us. Although interesting, the study of the implication of this difference in the molecular mechanisms by which the channel coupling is translated to longer channel openings is a topic that we will pursue in future studies. For the present study, we restricted our discussion to the fact that as CaV1.3L∆116 channels still have a C-terminus (396 aa) that is considerably longer than that of CaV1.3S channels, it is possible that another domain inside this region might be responsible for occluding the binding of CaM to the pre-IQ domain, and preventing CaV1.3L∆116 channel coupling. This discussion was added in the last paragraph of the subsection “Deletion of DCRD is not sufficient to allow coupling in CaV1.3L channels”. In addition, we performed experiments with the corrected version of the CaV1.3S where a single point substitution of a glycine by a serine at position 244 is corrected. We found that both channels have similar voltage-dependencies of activation and rate of activation (see new Figure 5—figure supplement 2A and 2B). The corrected CaV1.3S channels were also capable of undergoing Ca2+-dependent dimerization (split Venus reconstitution) and functional coupling (Figure 5—figure supplement 2C–2F). On the basis of these data, we concluded that the G244S substitution in the plasmid #26576 is functionally silent with respect to activation, rate of activation as well as the ability of CaV1.3S channels to undergo allosteric interactions. Therefore, we decided to clarify in the Methods section of the manuscript (subsection “Plasmid constructs and tsA-201 cell transfection”), that both plasmids were used to express and design the functional CaV1.3S constructs reported in this study. 3) What is the kinetics of the facilitation? Figures 1A and 1B suggest it occurs immediately upon channel activation within 1 ms. This seems very fast for the inter-molecular binding mechanism proposed in Figure 10. Also, how fast does the system reset after closing the channel? We certainly agree with the reviewer that determining the kinetics of the coupling of CaV1.3S channels is an interesting question. We have shown recently for the CaV1.2 channels that it can be done using FRET (Dixon et al. eLife 2015). However, we have not yet done those experiments for the CaV1.3S channels and would like to defer that work for inclusion in our subsequent study. 4) Does CaM1234 prevent the facilitation observed with CaV1.3s in whole-cell currents (i.e. what does Figure 1A, B look like with CaM1234)? This is an interesting question. We presented evidence showing that CaM1234 prevents the increase in coupling coefficient and the increase in sparklet activity (nPs) in response to depolarization, compared to the 7-fold increase seen in control conditions (Figure 6G – 6I). We consider that the reduction of the nPs is a good piece of evidence that CaM1234 prevents the coupling and the facilitation of CaV1.3S channels. 5) Light-induced dimerization experiments in Figure 4. Seems to me that these experiments should be done with Ba2+ and not Ca2+ as charge carrier? If idea is the dimerization is sufficient to induce facilitation, having Ca2+ also present complicates the interpretation. We appreciate the reviewer's comment, as it made us cognizant of the fact that the rationale for these experiments and their interpretation were not clearly described in the original version of the manuscript. We now clarify in the subsection “Physical interaction between CaV1.3S channels induces ICa facilitation”, that we do not believe dimerization itself is sufficient to induce facilitation. We have adduced many lines of evidence showing that Ca2+ and CaM are critically required for physical and functional channel coupling of CaV1.3S channels. Thus we propose that fusing adjoined CaV1.3S channels at the tip of their C-termini with the CIBN-CRY2 system increases the probability of functional coupling, but is not likely sufficient to induce functional channel coupling. 6) What is the CaM that actually produces the proposed channel coupling? The ability of CaM1234 to prevent facilitation would suggest that apoCaM preassociated with the channel is responsible. However, the effectiveness of MLCKp suggests a soluble CaM. If both of these are true then it is inconsistent with the simple model proposed in Figure 10. The authors need to provide a model that fits all the facts they present. Thanks for the suggestion to make a more complete model. Our results suggest that both tethered and soluble apoCaM bind the pre-IQ domain to induce channel coupling. We modified the model accordingly (see Figure 11) and stated both possibilities in the figure legend and in the manuscript (subsection “Functional CaV1.3S-to-CaV1.3S channel coupling is mediated by physical interactions between Ca2+-CaM and the pre-IQ domain“, first paragraph). Determining the effect of L-type antagonists in the increase in firing rate is a good suggestion. We performed additional experiments to answer this question. 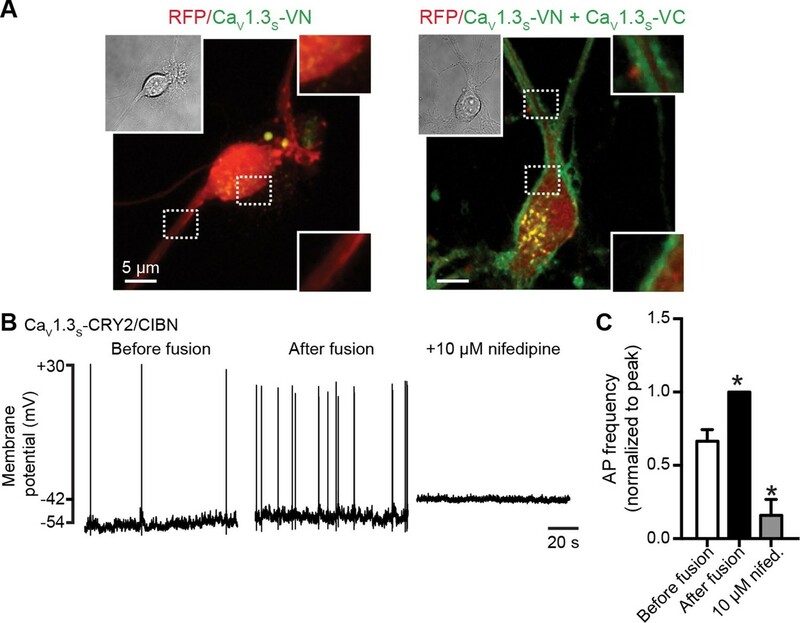 The application of 10 μM nifedipine in hippocampal neurons, expressing CaV1.3S-CIBN/CRY2, not only eliminated the light-induced increase in firing rate but decreased significantly the spontaneous firing (Figure 10B and 10C). This highlights the importance of low-voltage-activated L-type channels in the firing pattern of hippocampal neurons. Two major points need to be considered to fully support the conclusions drawn from the experiments presented: 1) The authors describe the use of the CaV1.3 alpha1 rat constructs Addgene plasmid 26577 (long) and 26576 (short). This selection is very unfortunate. Both constructs contain a number of mutations originally introduced by cloning the full-length alpha1-subunits. Addgene (meanwhile?) also provides the corrected versions (plasmids 49332 and 49333). We agree with the reviewer that, so far, no anti-CaV1.3 antibody with proven specificity in KO controls exist and thank for the suggestion to clarify this caveat in the manuscript. As suggested, this limitation in our study is now noted in the revised manuscript (subsection “CaV1.3 channels in hippocampal neurons aggregate in dense clusters”, first paragraph). In addition, we now clarify in the manuscript that as we were not able to test the specificity of the antibody on CaV1.3-KO neurons, we pursued our analyses of channel clustering using a heterologous expression of CaV1.3 channels in tsA-201 cells. The specificity of the antibody in tsA-201 cells was tested by immunostaining untransfected and CaV1.3S-transfected cells. No evidence of staining was observed in the untransfected cells (see new Figure 3—figure supplement 1A). We also consider that our results using the step-photobleaching of expressed CaV1.3S-mGFP is a strong piece of evidence that these channels organize in clusters in hippocampal neurons. In addition, the average number of channels per cluster in both hippocampal neurons and tsA-201 cells correlates with the mean areas calculated from the super-resolution data. Finally, we were able to see an increase in the cluster number when we compared untransfected and CaV1.3SVC/VN transfected hippocampal neurons (Figure 10—figure supplement 1). We performed the control experiment suggested by the reviewer. The new Figure 9 includes data showing that sparklet site activity was decreased by application of 300 nM of the dihydropyridine antagonist isradipine and completely eliminated when the concentration of the drug was increased to 10 µM (Figure 9A and 9B). This is consistent with the hypothesis that sparklets in hippocampal neurons were produced by L-type calcium channels. Both CaV1.2 and CaV1.3 channels are expressed in hippocampal neurons (Hell et al., 1993) and although it is impossible to distinguish between these two L-type Ca2+ channels using either electrophysiological or pharmacological methods, it has been shown that CaV1.3 channels have a reduced sensitivity to dihydropyridines compared to CaV1.2 channels (Lipscombe et al., 2004; Xu and Lipscombe, 2001). A previous study by Koschak et al. found that 100% of CaV1.2 channels but only ~60% of CaV1.3 channels are inhibited by 300 nM isradipine (Koschak et al., 2001), given this, it is reasonable to assume that any sparklet remaining after application of 300 nM isradipine is more likely to be generated by CaV1.3 channels than CaV1.2. This discussion was added to the manuscript (subsection “Coupling of CaV1.3S channels increases the firing rate of hippocampal neuron”, first paragraph). We thank Dr. Bertil Hille and Dr. Manuel F Navedo for comments and Dr. Joshua Vaughan for help with super-resolution analysis. Dr. William Catterall and Dr. Ruth E Westenbroek provided antibodies against CaV1.3. Animal experimentation: This study was performed in strict accordance with the recommendations in the Guide for the Care and Use of Laboratory Animals of the National Institutes of Health. All of the animals were handled according to approved institutional animal care and use committee (IACUC) protocols (#3374-01) of the University of Washington and (#18896) of the University of California, Davis. © 2016, Moreno et al.